Contemporary North Korea watchers (including myself) first noticed this boat in a Google Earth satellite image dated 2015-10-4. I mentioned it in articles for RFA (2016-2-3) and NK News. 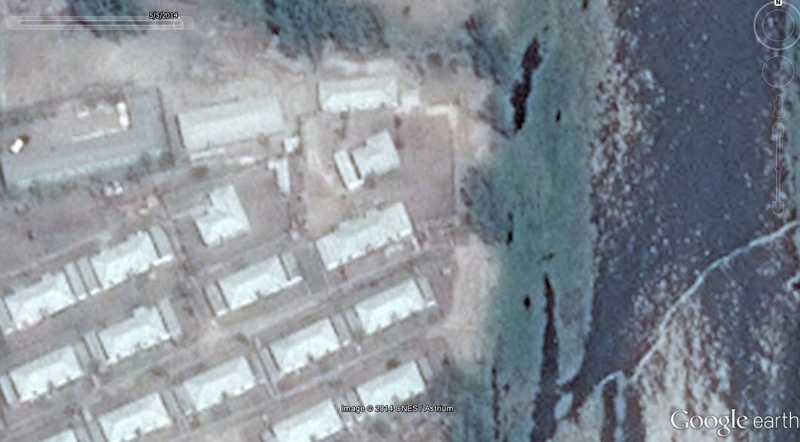 A check of historical imagery of the Nampho area also reveals the boat docked there on 2013-11-4. The boat is quite large (appx 50m in length). 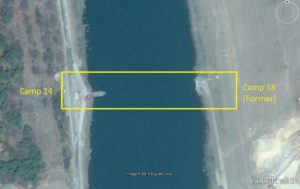 At the time of publication, I speculated that it might be stored at a large boat house in north-eastern Pyongyang with some other leadership boats. Though this is the largest boat house I am aware of on the Taedong River, I am still not sure if this is the case. 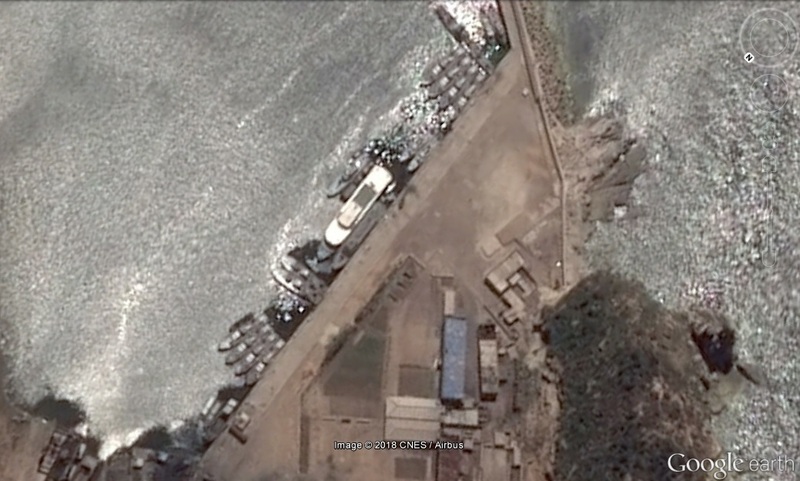 Subsequent imagery shows the boat berthed on Chol-do at KPA Navy Unit 123 (2016-5-31). 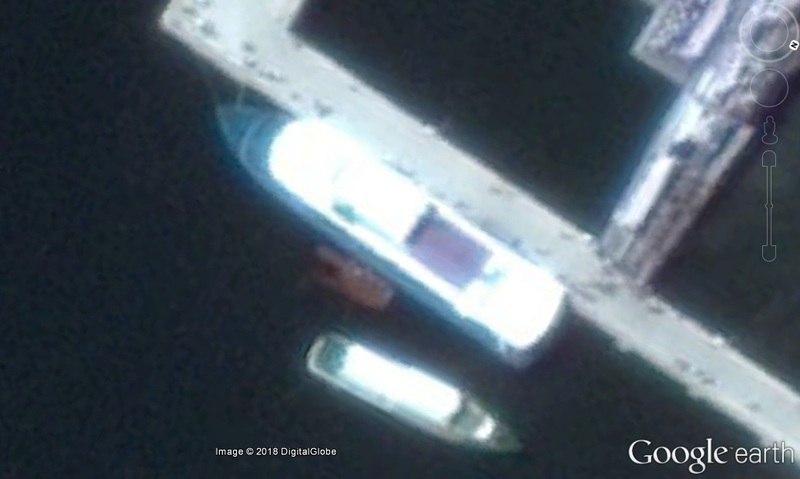 Despite the boat’s size, it does not appear on any other public (Google Earth) satellite imagery as far as I am aware. Although its current purpose remains a mystery, it was recently featured on KCTV. 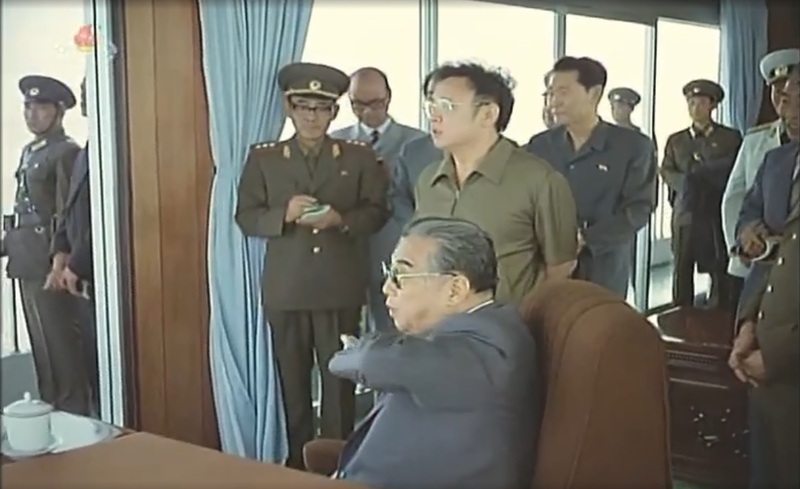 According to the footage, the boat is actually quite old, and it used to be one of Kim Il-sung’s. 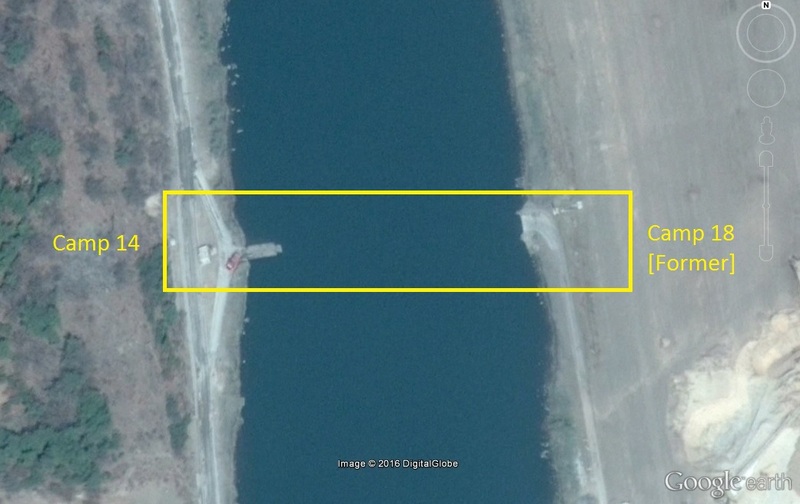 So despite only being recently “discovered” by the open source community, the boat appears to have been around for some time, and it does not appear to violate the UNSC prohibition on the export of luxury goods to North Korea. 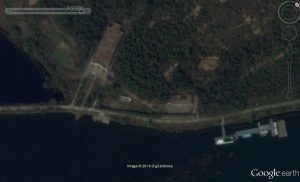 It may be one of Kim Jong-un’s boats (he may have inherited it), but it is possible it has been “handed down” to some other agency (for use by senior navy personnel for example) at some point when the Kim family upgraded their transportation options. 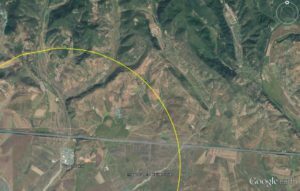 The evidence for this latter theory is that the boat’s location does not coincide with any of Kim Jong-un’s guidance trips. However, this is not definitive evidence since Kim makes public appearances that are not reported in the official media, or are reported to have taken place on different days than they actually occurred. 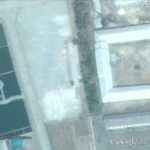 What happened to the Camp 15 (Yodok) Prisoners? I have already published this in Radio Free Asia, so here is the English-language version. I have previously written about the apparent decommissioning/downsizing of Camp No. 15 (Yodok) here. There has been some speculation in the media and in the human rights community about what has happened to the prisoners, but I am unaware of a final, conclusive evaluation. 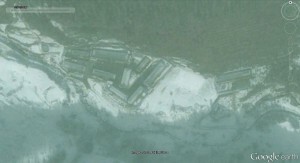 Based on observations in satellite imagery, particularly from patterns of activity related to the decommissioned and recommissioned area that is known as Camp 18 (I don’t know the current name of the new camp since it was reopened), I suspect some of the prisoners have been moved from Camp 15 (Yodok) to the Kowon Mine area of Sudong District, South Phyongan Province. 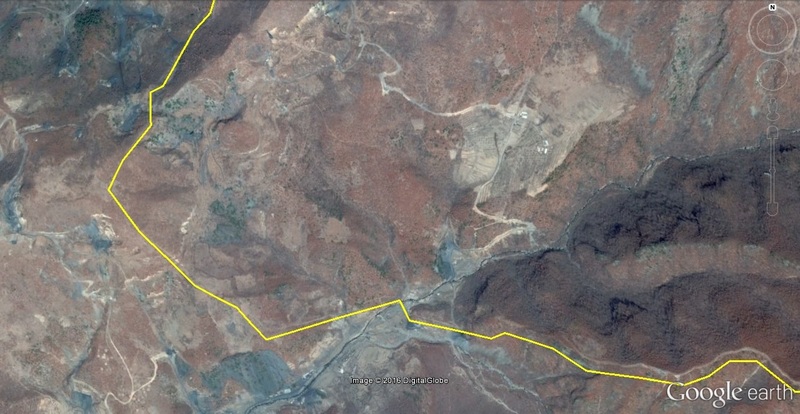 Pictured Above (Google Earth): The geographic relationship between Camp 15 and the Kowon Mine in Sudong District. In Camp 15, the first housing to be raised was in the Revolutionizing Zone in 2014. 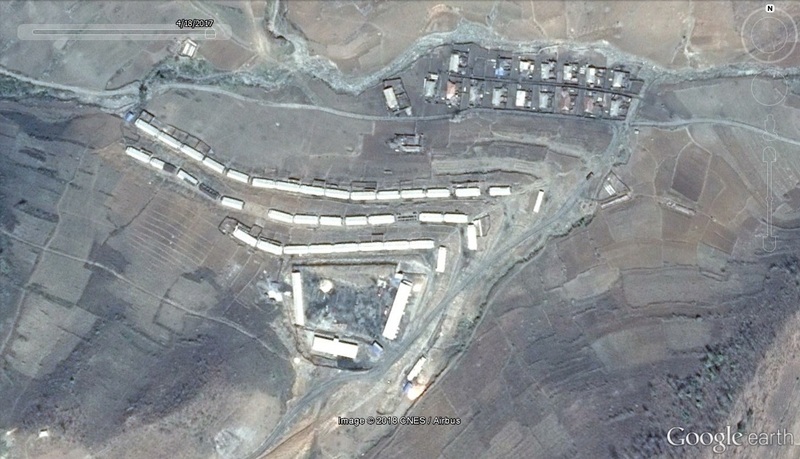 Shortly after that, housing in other parts of the camp slowly began falling into obvious states of disuse. However, the period where the most housing was razed or deteriorated took place after 2016-6-2. 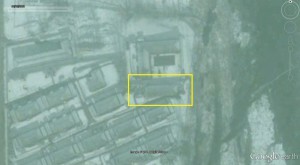 No significant new housing was built in the town of Yodok, the closest town to the entrance of the prison camp, since the decommission/downsizing process began. 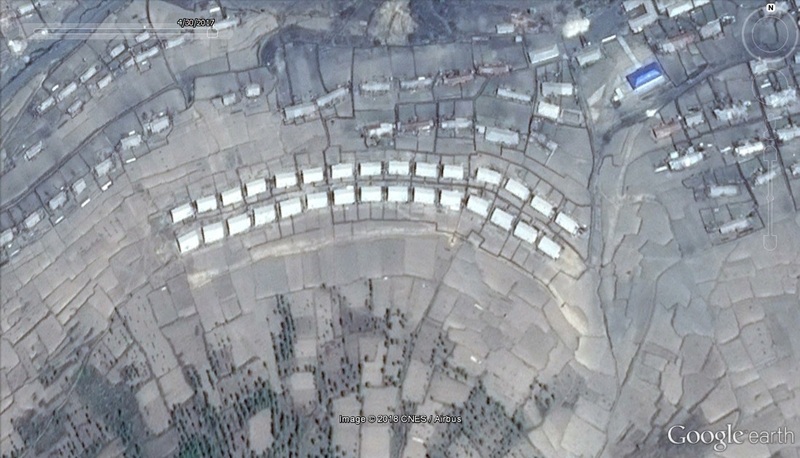 However, an unusual level of new housing was constructed at the remote Kowon Mine and in the nearby town of Sudong. 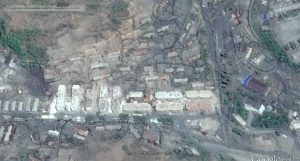 Pictured below is an overview of new housing that was constructed between 2014 and 2017. In the picture above (Top: 2014-5-5) we can see ten apartment blocks that are in different states of completion. This is the earliest available Google Earth image of this site, so I cannot say for sure when construction started. 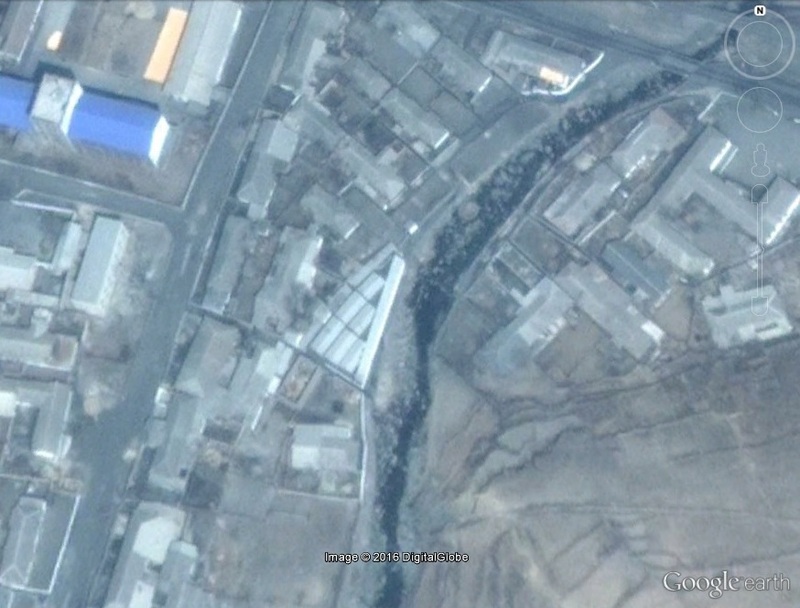 In the lower picture above (2017-4-18) we can see that all of the buildings have been completed, at least on the outside. 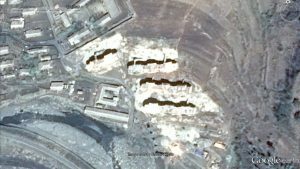 In the picture above (2017-4-18), we can see 22 apartment blocks under construction. 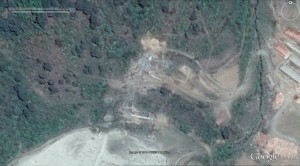 It is not possible to say when construction work started or finished using Google Earth imagery. 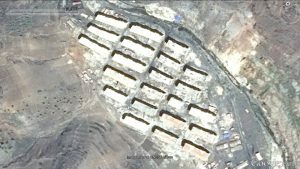 In the picture above (2017-4-18), we can see four apartment blocks under construction. 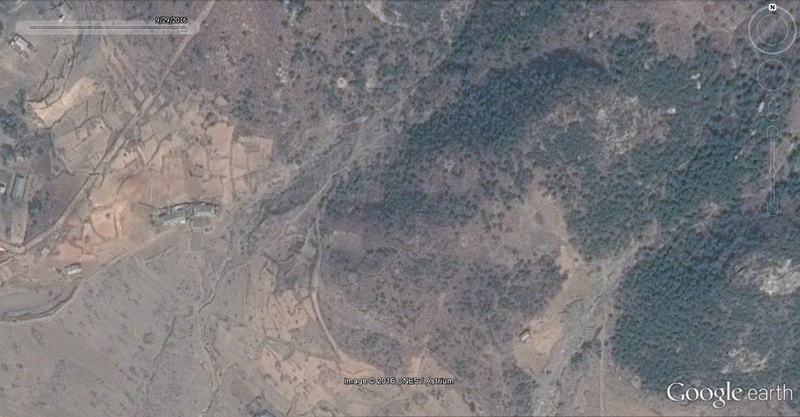 In the top image (2014-5-5), we can see the area before construction began. 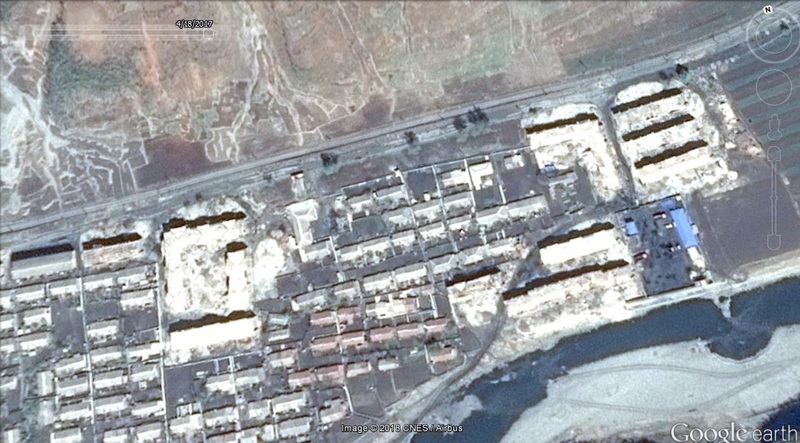 In the bottom image (2017-4-18), we can see nine apartment buildings under construction. The evidence I have presented here is not conclusive, but it is worthy of further investigation by those with budgets to do so. 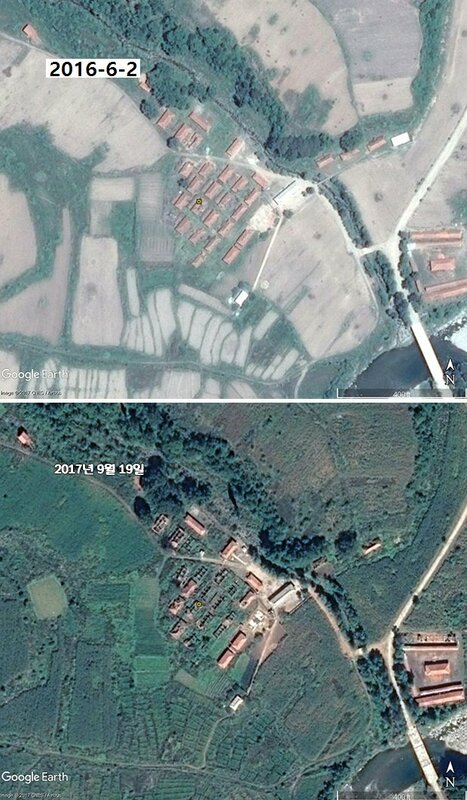 In the images above, I have shown an uncharacteristic increase in local housing construction that takes place at the same time as housing in nearby prison camp 15 is being razed. 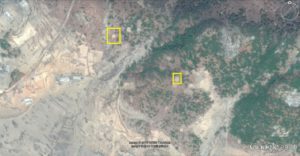 There is not a similar build-up of housing at any of the other mines or towns near Camp 15, particularly Munchon and Chonnae Coal Mines, as far as I am aware. 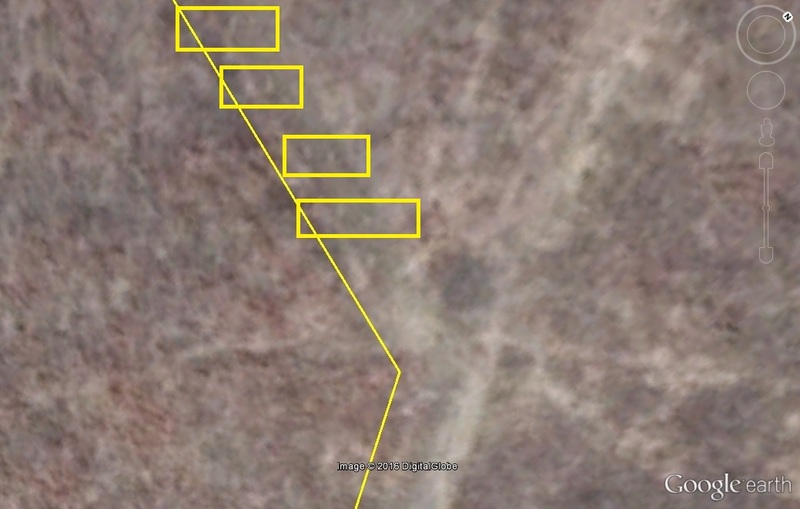 Additionally this pattern of resettlement to a nearby mine is the same that we saw with the closure and reopening of Camp 18. It would not be too hard to estimate the number of apartments and families that are moving into these buildings, so if any readers want to do so and send me the findings, I will post them here. 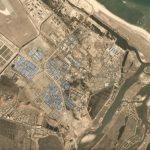 UPDATE 6 (2018-3-15): Planet Labs (@planetlabs) has posted some March 2018 imagery of construction of the Kalma Coastal Tourist Area construction site. 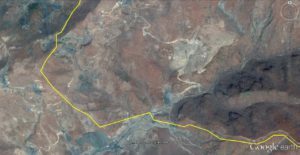 UPDATE 5 (2018-2-2): The web page DPRK Today conducted an interview with a North Korean official about the Kalma project. NK News offers a good English-language article about the interview here. 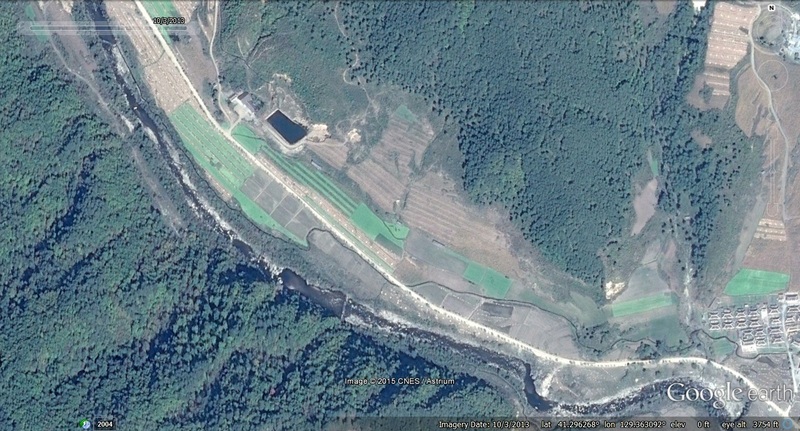 The development of the Wonsan-Kalma coastal tourist zone is a priority project in the DPRK this year. Seaside resorts are tourist destinations that are found by the coast. The most suitable places for them are those with conditions favourable for such seaside tourist activities as swimming, sunbathing, angling, yachting, boating, motorboating, surfing and scuba diving in terms of the percentage and duration of sunshine, number of days with average temperature of 18-20℃ and with no or weak wind and the condition of seashore. Especially those with sandy beaches are so suitable for coastal tourism that many countries develop such areas into seaside resorts. Currently, such resorts hold a significant proportion of the world-class natural tourist destinations and most of summer vacationers tour the seaside. 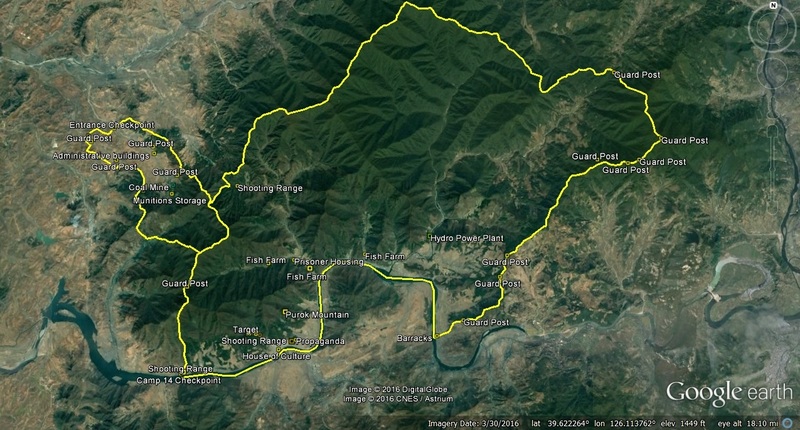 In the DPRK, many renowned seaside scenic attractions, including Songdowon and Lake Sijung of Kangwon Province, Majon of South Hamgyong Province and Ryongsupho of South Hwanghae Province, turned into coastal tourist centres. The Wonsan-Kalma area in Kangwon Province is also a very promising seaside resort. 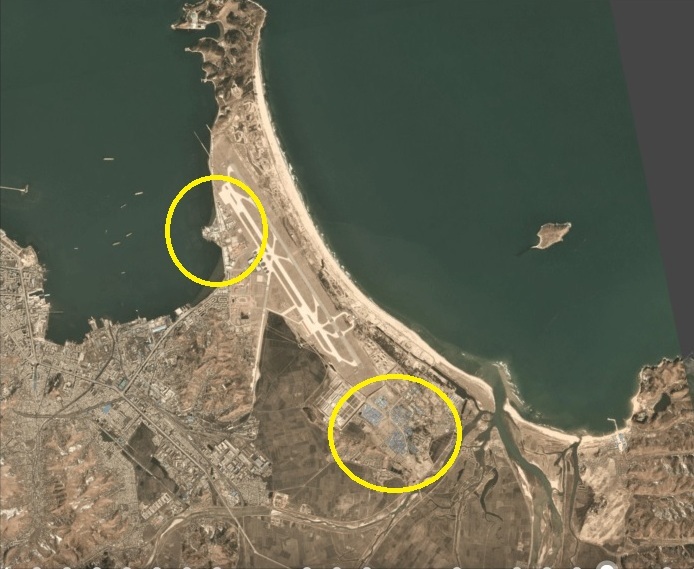 The Kalma peninsula in the southern part of the Wonsan Bay is an attached island which was formed by the wave-driven accumulation of granitic sand from the Namdae River. The northern part of the peninsula which stands long from south to north consists in gently rolling hills and the coastline is mostly straight and smooth. To the north lies the Hodo peninsula which stretches out from the opposite direction and in between there are Sin, Tae and other islets, serving as a natural breakwater that protects the port of Wonsan. There is a scenic attraction called Myongsasipri which means a famous sand beach stretching for 4 kilometres in the Kalma peninsula. A goldenrain tree rare to be found in the eastern coastal areas of the country stands at the entrance to the beach which is dotted with sweet briars. The red flowers in full bloom along the seaside surrounded by tall pines and clear blue waves of the East Sea form a harmonious whole to present a spectacular beauty. 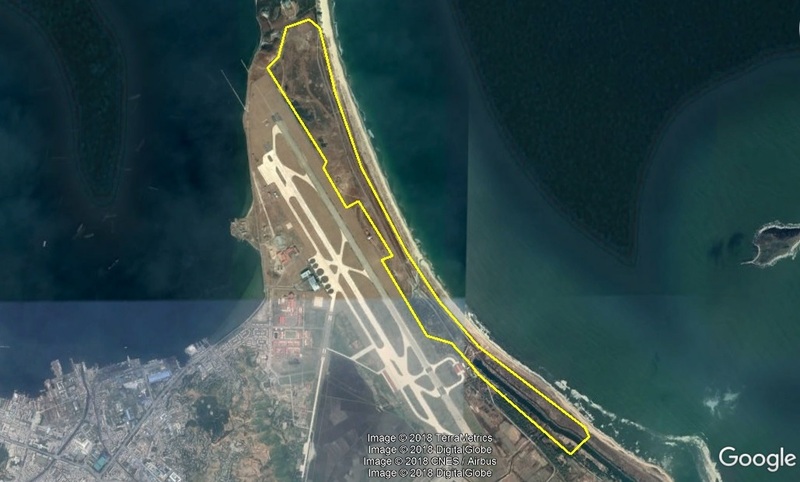 The construction of the seaside resort in the Wonsan-Kalma area with Kalma airport will help satisfy the demands of local and foreign tourists and provide an ideal place for stopover between different tourist destinations and Wonsan-Mt Kumgang International Tourist Zone. At present, preparations are being pushed ahead to complete as early as possible the Wonsan-Kalma project which will mark a turning point in raising the country’s tourism to the world level. 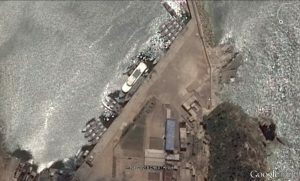 The North Korean authorities are mobilizing ordinary citizens and military conscripts alike in a push to accelerate construction of the “Wonsan Kalma Shore Tourist Zone” situated on the country’s east coast. 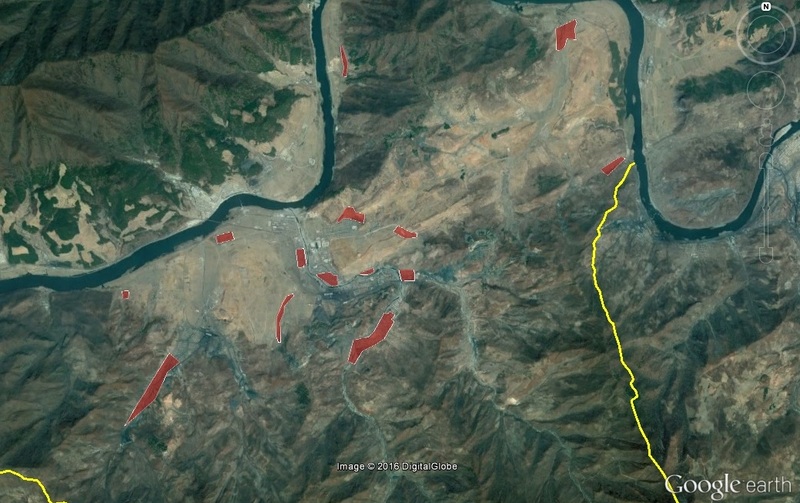 Sources inside North Korea report that the authorities have conveyed their intentions to complete the project before the July 27 “Victory Day” holiday, which is referred to as National Korean War Veterans Armistice Day in South Korea. 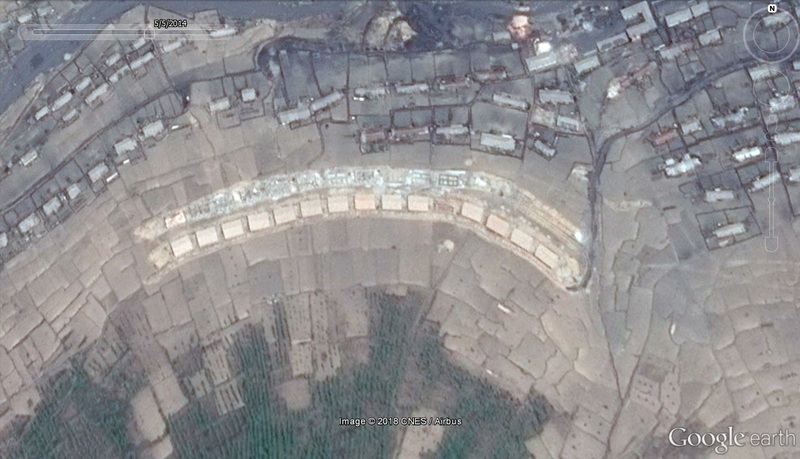 The bottom photo clearly shows a large compound of temporary housing for construction workers. 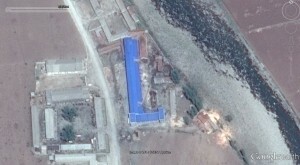 This kind of facility can be seen at all of North Korea’s large scale construction projects. 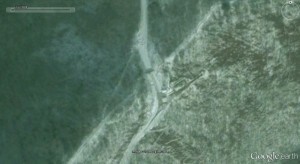 The coordinates are 39.144608°, 127.503932° for those that are interested. 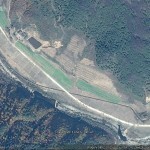 It is still difficult to see any significant construction taking place on the northern end of the peninsula. 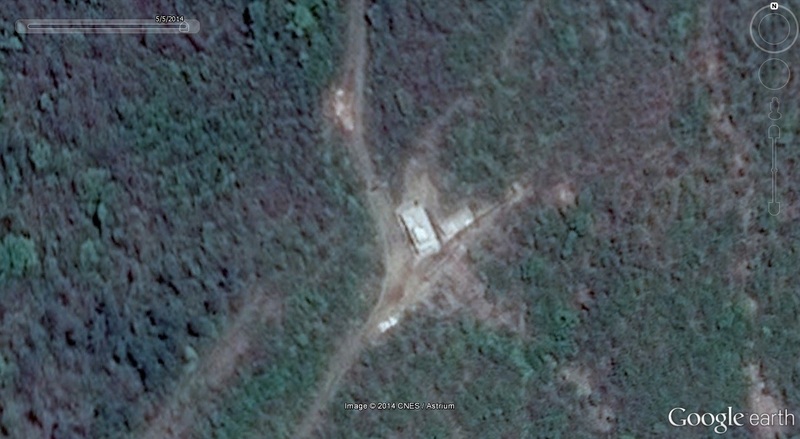 Planet imagery in this case is rather limited, but it also appears the construction project itself is rather recent. In the Planet image below, dated 2018-1-12, we can see just how much worker housing has been constructed in just the last two weeks. 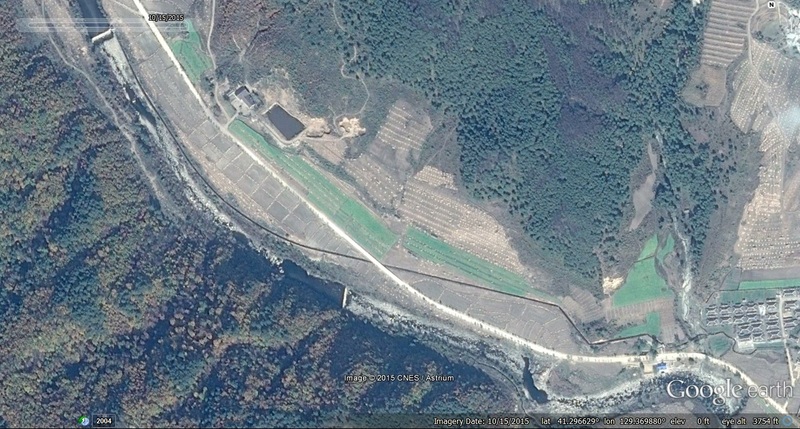 If the Daily NK is correct, and this is the “Wonsan Kalma Shore Tourist Zone,” and not part of the “Wonsan-Mt. 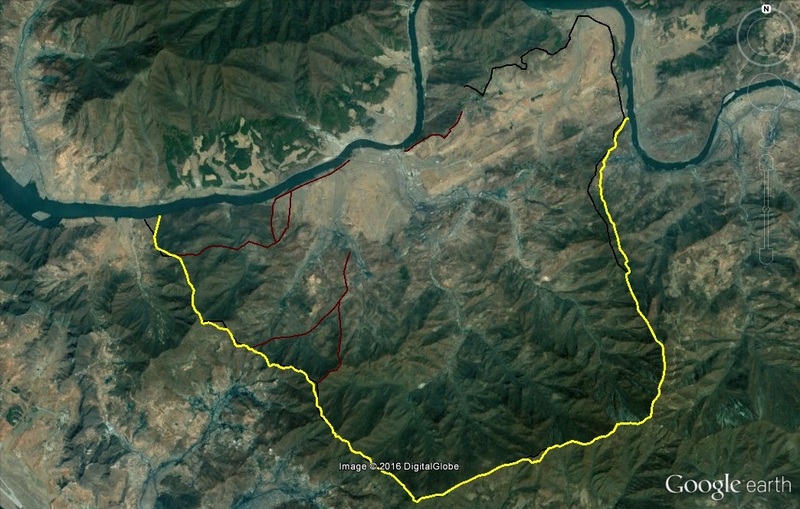 Kumgang Tourist Zone,” then this indicates that plans for the area are still changing. This will be an interesting area to watch. 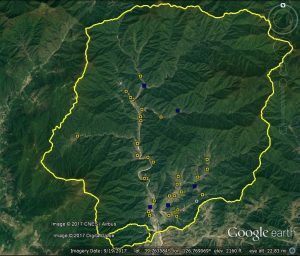 Here are previous posts I have done on the Kalma Peninsula and Wonsan-Mt. 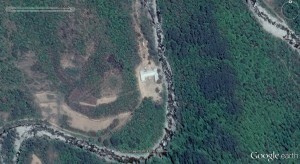 Kumgang International Tourist Zone. 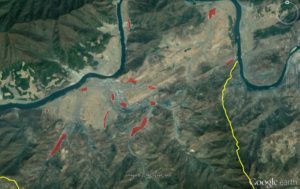 Here is a relevant article I wrote for NK News back in 2013. 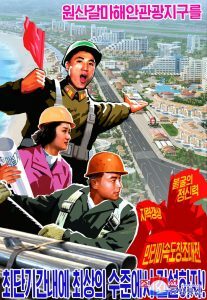 These posters give the impression that this project as ambitious as any of the major construction projects they have done in Pyongyang (Mansudae parts 1 and 2, Unha Scientist Street, Satellite Scientist Street, Mirae Scientist Street and Ryomyong Scientist Street). I previously posted about Part 2 of the Satellite Scientists Street, but it looks that that project will take a back seat to this one. 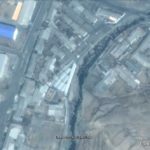 The previously announced (2015) “Kalma Street” project appears to have stalled in 2017, and this new tourist zone is apparently unrelated. It is unclear if the Kalma Street project will be completed or if it has been scrapped. A tourist resort is to be built in the Wonsan-Kalma coastal area in Kangwon Province, the DPRK on a large scale. The Wonsan-Kalma area is good for coastal tourism. 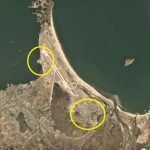 The Kalma Peninsula in the southern part of Wonsan bay is the connecting bar formed with granite sand. The northern part of the peninsula ranging north and south is low hill and its coastline is straight and smooth as a whole. It faces the Hodo Peninsula to the north and Sin, Tae and other islets are located between them which serve as seawall of Wonsan Port. There are four-kilometer-long famous sandy beach resorts called Myongsasipri and modern Kalma Airport in the peninsula. 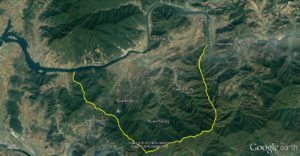 When the tourist area is built, it will satisfy the demand of domestic and foreign tourists and will be the most ideal place to link various tourist destinations to the Wonsan-Mt Kumgang international tourist zone. 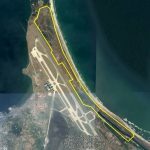 Now, a preparatory work is brisk for completing the construction of the Wonsan-Kalma coastal tourist area, a radical turn in putting the country’s tourism on world level. 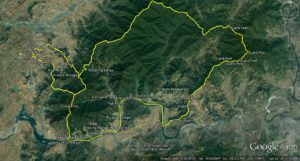 Pyongyang, July 15 (KCNA) — The Kalma area, located on the central east coast of Korea, will be turned into a tourist resort. The area boasts of four-kilometer-long beach resort, not far away from such scenic spots as Mt. 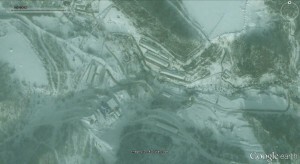 Kumgang, Lake Sijung, Chongsokjong and Lagoon Samil and the Masikryong Ski Resort. 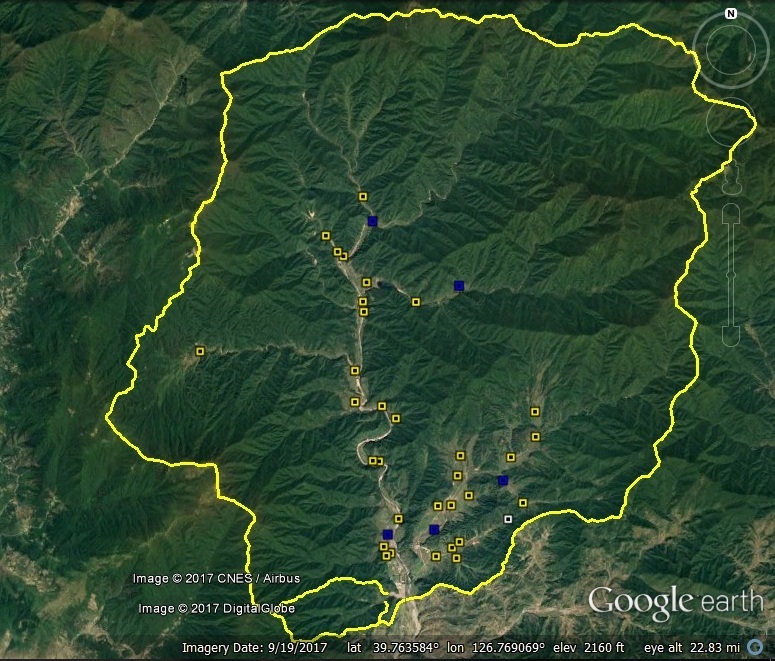 The DPRK Law on Economic Development Parks, enacted in May Juche 102 (2013), is applicable to the area. Under this law, foreign investors are allowed to conduct their business activities independently in the area. 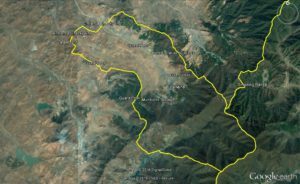 An international friendship air festival is to take place in Wonsan City, adjacent to the Kalma area, at the end of September. 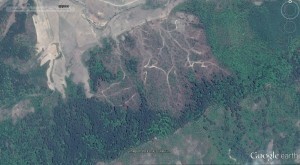 The official media hinted at this project a few days prior in a report on the Mubong Mubong Special Zone for International Tourism. 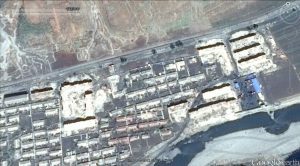 UPDATE 3 (2017-11-16): Google Earth Satellite imagery dated 2017-9-19 indicates that the vast majority of housing in Yodok Prison Camp (Kwanliso No. 15) shows signs of being demolished, deteriorated or uninhabited. There is also significant deterioration of economic units in the camp. However, only minor changes to the security and administrative infrastructure, so it is too soon to say the camp is closed. 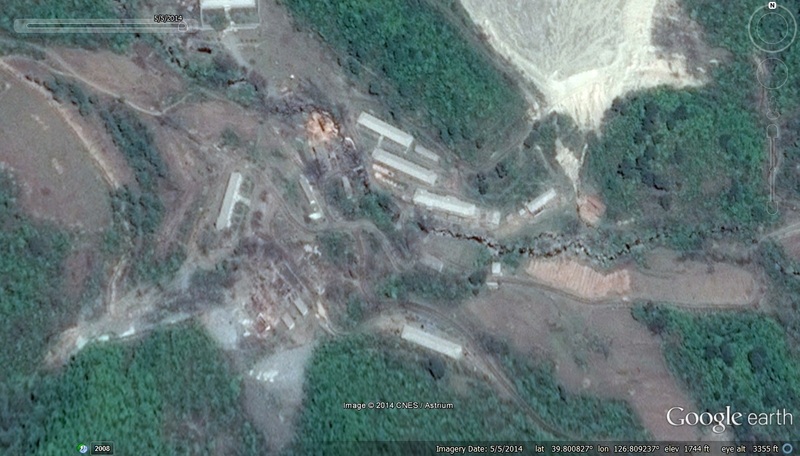 Below is an overview of the areas inside Camp 15 where I have observed razed or deteriorating facilities in the September 2017 imagery. Yellow pegs indicate razed/deteriorated housing. Blue pegs indicate deteriorated economic infrastructure. The single white peg is the demolished security facility. 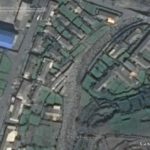 UPDATE 2 (2017-4-27): More prisoner housing in Yodok is being razed. In September 2015, Joseph Bermudez and the Committee for Human Rights in North Korea reported that the “Revolutionizing Zone” of Yodok Prison Camp (Camp 15) had been torn down as of October 2014. The “Revolutioninzing Zone” was for prisoners judged to be worthy of re-education through labor, and thus eligible for release. It is because there were prisoners who were released, and who later defected, that we know so much about the camp. 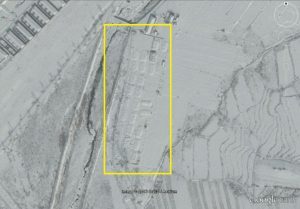 Based on new Google Earth imagery, it appears that additional housing inside the camp security perimeter has also been torn down sometime between June 2, 2016 and February 19, 2017. In the above images, we can see that 38 housing units have been razed, and only seven buildings remain standing. I presume that the remaining buildings still serve an economic or administrative function. What does this mean? Using this Google Earth imagery alone, it is still hard to say exactly what is happening in the camp. 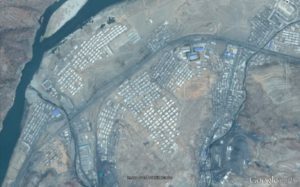 The new imagery only covers the eastern-half of the camp, so there may be changes on the western-half of the camp (such as the construction of new housing) that may offset the housing losses we have observed here. Is this good news for the prisoners? I cannot say. If the housing was torn down, and new housing was not built to replace it, it is possible prisoners were executed or transferred into pre-existing housing, leading to cramped, less-sanitary conditions. 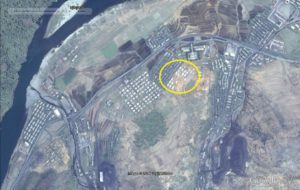 Some prisoners may have been released, but they could just as easily have been transferred to the new prison camp that was opened up on the site of the closed Camp 18. Is the camp being closed? This rumor has been floating around for several years. The theory that North Korea desires to close the camp at some date in the future is consistent with the observations we have seen–in that a process of gradual reduction in prisoners and prisoner housing is taking place over time. 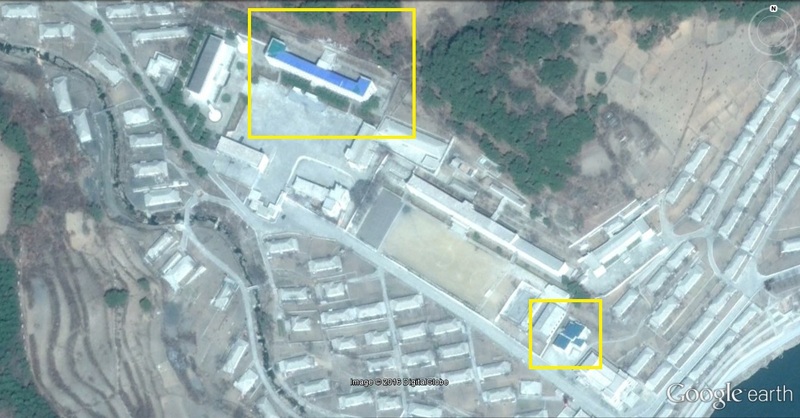 However, we still do not know if new housing has been built on areas that are not covered by recent satellite imagery, and we do not know if the camp’s closure will lead to an outcome that the prisoners would find welfare-enhancing (Are they being executed, transferred, or released?). 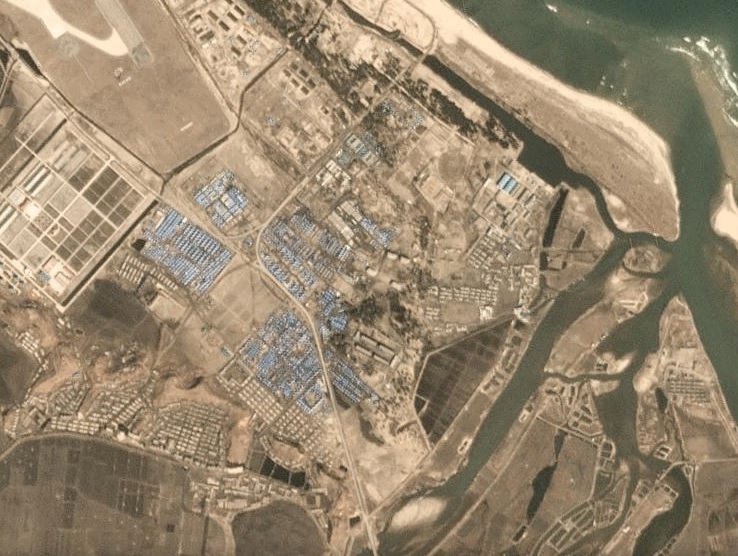 As far as I can tell, the administrative portion of the camp, near the southern entrance (and the security perimeter) have seen no substantive changes over this same period. As always, we need more imagery and more testimony. This has been reported in Radio Free Asia. 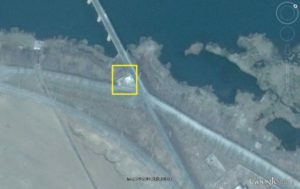 UPDATE 1 (2015-2-17): HRNK has published a report on Camp 15 that confirms some of the information on this web page and adds more. 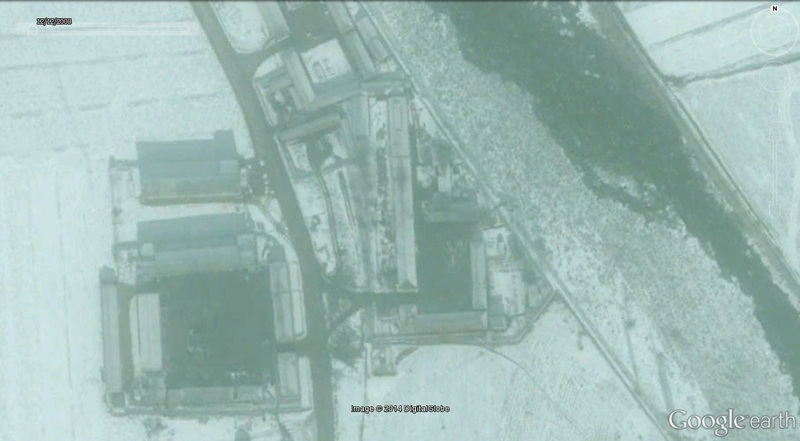 ORIGINAL POST (2014-12-9): I do not really focus in human rights issues. 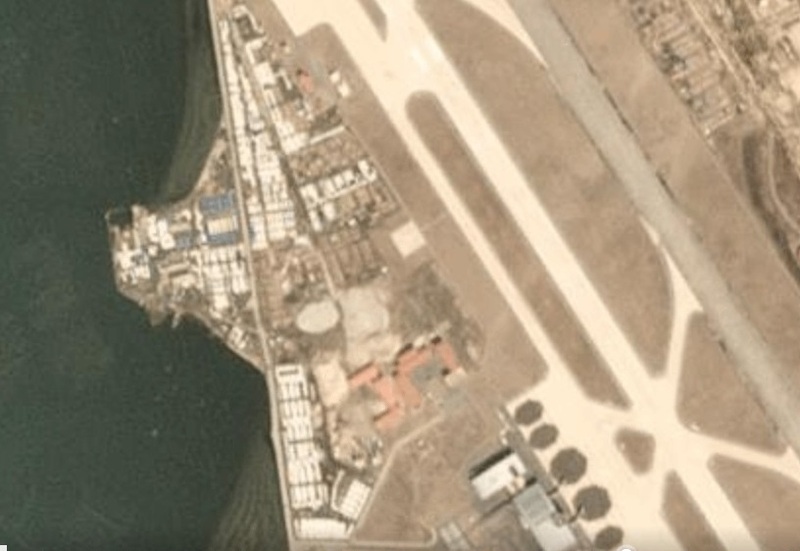 The only real exception to this is that I keep up with new satellite imagery of incarceration facilities when pictures are released on services like Google Earth. 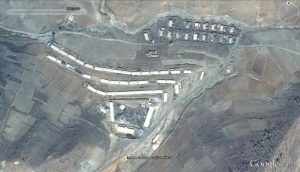 In the past couple of years, we have seen interesting developments in the camps. 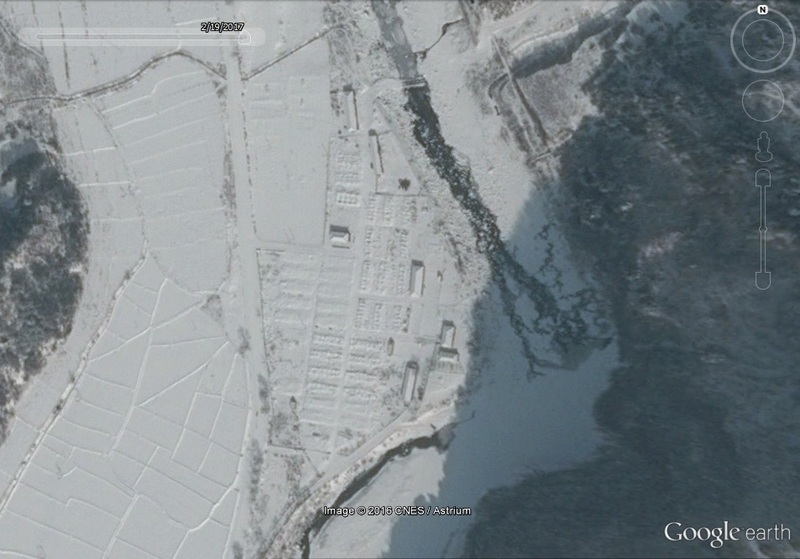 No.’s 18 and 22 were closed, and are being converted into ordinary villages and coal mines. 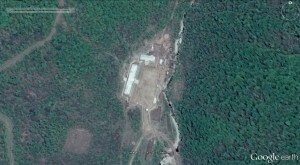 I was also the first to write about the expansion of Camp 14 and Camp 25. There have also been minor changes to Camp 16, and I was able to point out exports from the camp that are possibly used for generating hard currency. 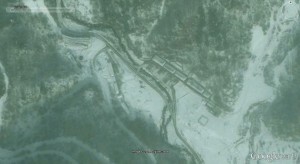 So now we turn our heads to Camp 15, AKA Yodok. 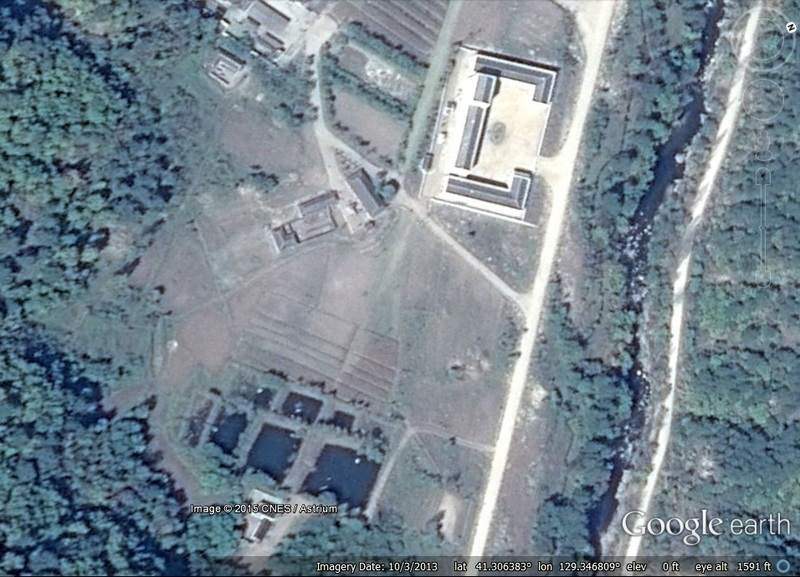 This was the most “well known” of the prison camps before Shin Dong-hyok’s book on Camp 14 was published. Yodok was the subject of Kang Chol-hwan’s The Aquariums of Pyongyang, and it even inspired a musical. 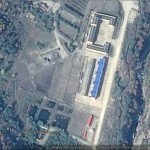 Camp 15 is an enormous facility in Yodok County, South Hamgyong Province. 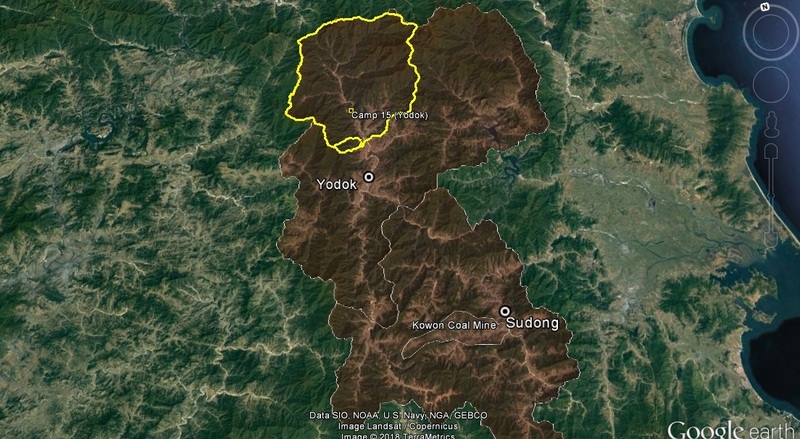 It borders Maengsan County, Nyongwon County and Taehung County in South Phyongan Province. 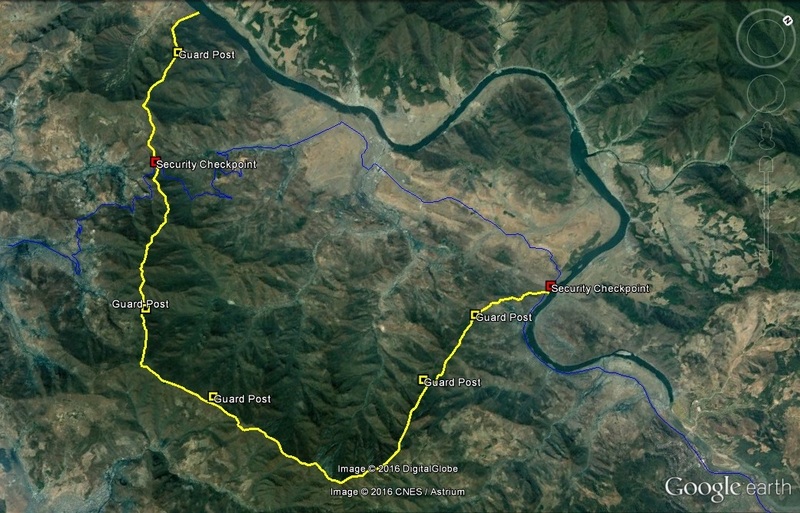 The camp is over 22km from north to south and over 20km from east to west. 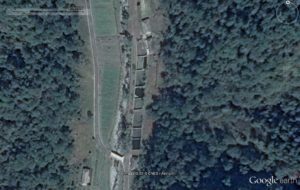 There are two entrances to the camp. 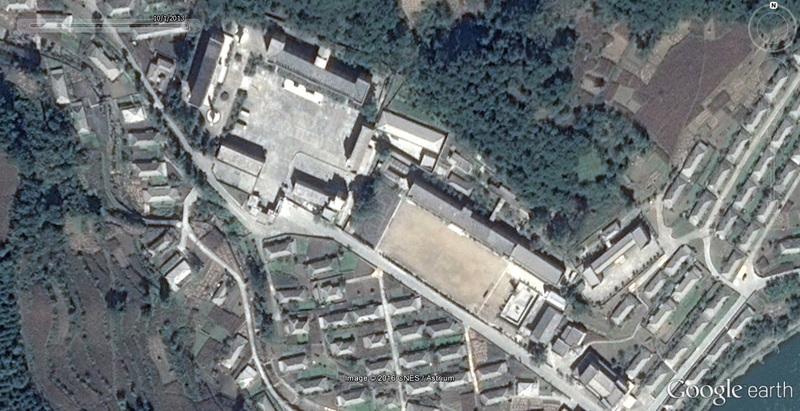 The main entrance is on the south side, just north of kuup-ri (구읍리) and approximately six kilometers from the town of Yodok (요덕). 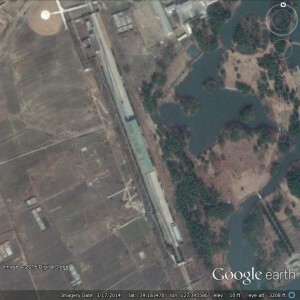 There is a secondary entrance on the north end of the camp on Paek-san that borders with Nyongwon County. 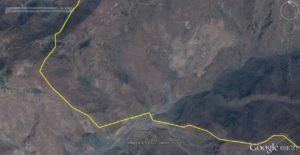 According to North Korean sources, there are four villages (리) officially listed within the camp perimeter: Ryongphyong-ri (룡평리), Phyongjon-ri (평전리), Ripsok-ri (립석리) and Taesuk-ri (대숙리). The whole encampment is surrounded by a barbed-wire fence measuring 3 to 4 meters (10 to 13 feet) in height. 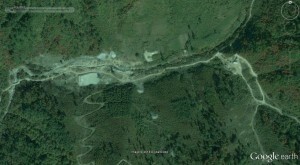 In some areas there are walls 2 to 3 meters (7 to 10 feet) tall, topped with electrical wire. Along the fence there are watchtowers measuring 7 to 8 meters (23 to 26 feet) in height, set at 1-kilometer (0.62-mile) intervals, and patrolled by 1,000 guards armed with automatic rifles and hand grenades. Additionally, there are teams with guard dogs. Inside the camp, each village has two guards on duty at all times. 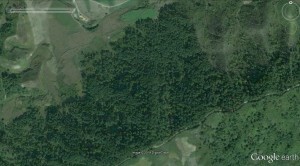 Pictured above: The borders of Camp 15, AKA, Yodok. 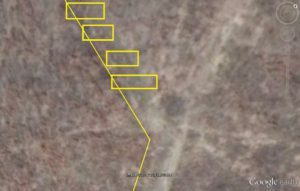 I have viewed satellite imagery from as recent as October 20, 2014, and based on that evidence, I am unsure of the present status of the camp. 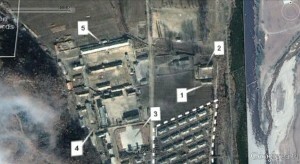 Mines have been closed along with Sorimchon District, but guard housing has increased, as have security units. I also saw no change in the security perimeter. 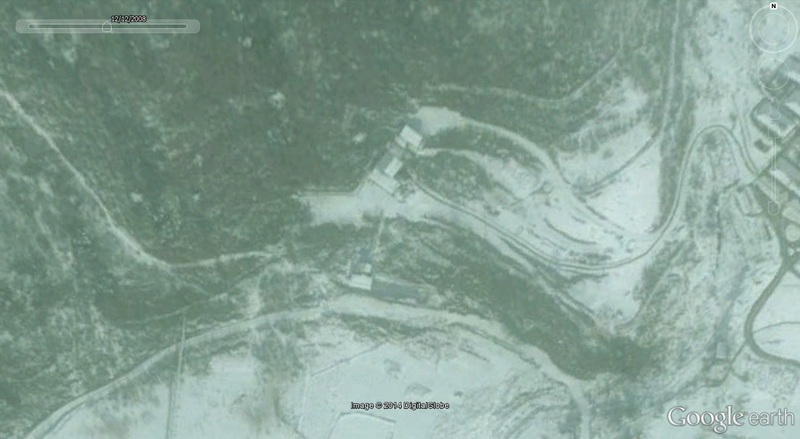 Below is a list of changes with before and after images that can be seen on Google Earth. Although the latest Google Earth imagery is dated 2014-5-5, I did not see anything on imagery from October 20, 2014 that added to this analysis. 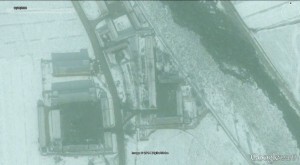 This area was first described (in English) in the second version of HRNK’s Hidden Gulag (See pages: 56, 64, 66, and 68. 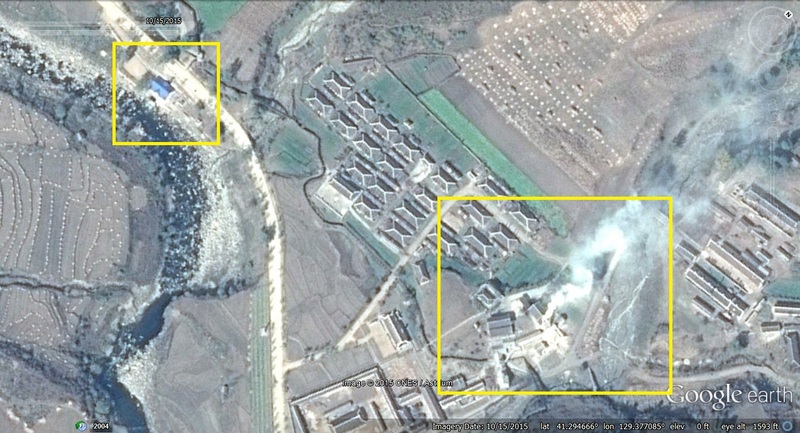 On Page 69 is a map, and on page 199 is a labeled satellite image). 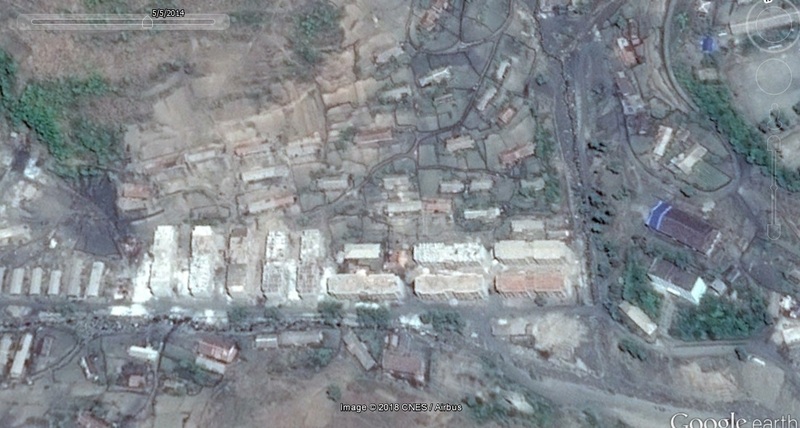 Sometime between 2008-12-12 and 2014-5-5 most of these buildings were destroyed. 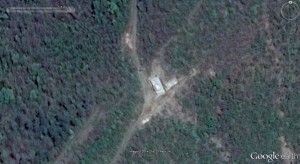 The only remaining building is thought to be the Ministry for State Security (MSS, SSD, NSA) office. 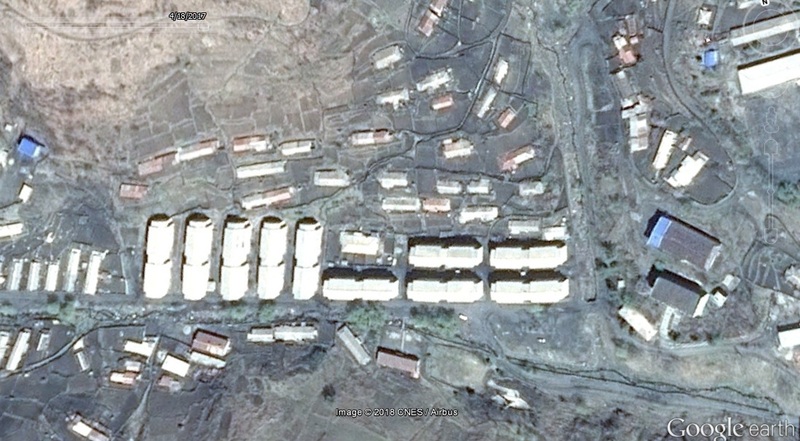 All of this housing remained as of October 20, 2014. 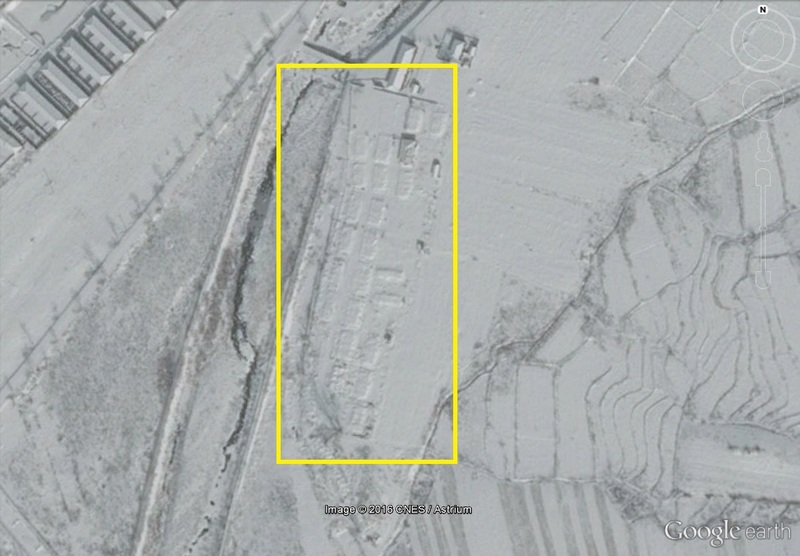 Archaeologists of the DPRK Academy of Social Sciences have recently unearthed a large group of tombs dating back to Koguryo Kingdom (B.C. 277-A.D. 668). The group tombs are located on a hill, about 2 kilometers northeast of Chondok-ri seat, Pongsan County of North Hwanghae Province. 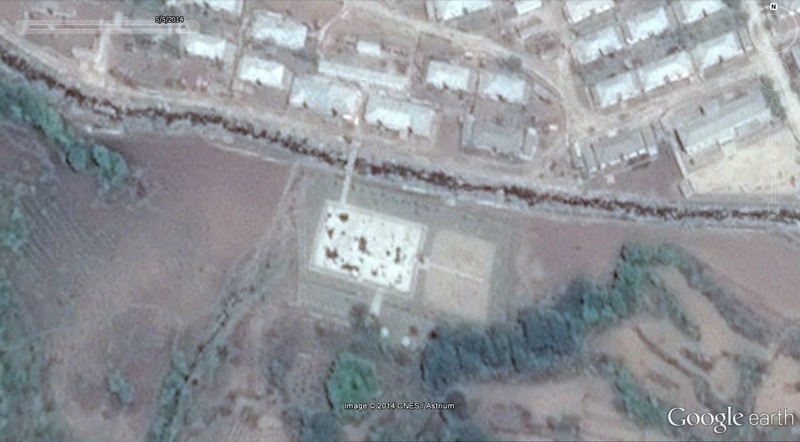 There are nearly 30 tombs in four rows in an area of 185 square meters with individual ones around it, which shows the area was a big burial site with hundreds tombs. Most of tombs are 10 meters in diameter and 2 meters in height and the biggest one is 17 meters in diameter and 2.4 meters in height. The tombs are arranged at intervals of 10-20 meters and can be divided into the earthen one with a stone chamber and the other with two stone chambers, all of them with arch-style or inclined-plane ceilings before getting collapsed. Unearthed from the tombs were human and horse bones, bronze spoons and decorations, silver-clad iron nails, iron handles of coffin, grey earthenware and other remains. 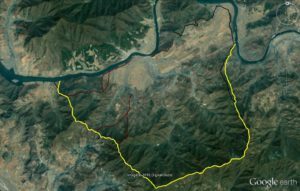 The newly-unearthed tombs and remains will serve as material evidence to give fresh understanding of advanced cultural development of Koguryo, a powerful state that existed in the East for a thousand years, and precious treasures showing the good qualities of the Korean nation. 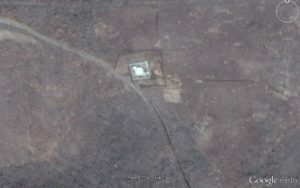 KCTV footage of the tombs can be seen here. Has Camp 18 been re-opened or merged with Camp 14? 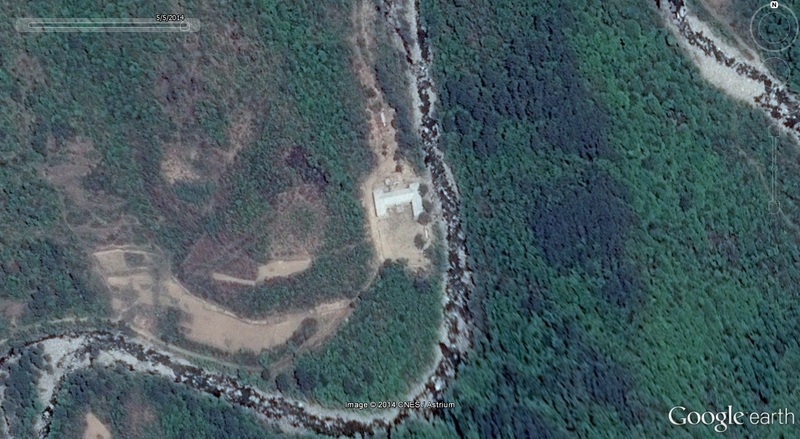 The consensus among North Korea watchers (myself included) was that Camp 18 had been closed sometime in the late 2000s (between 2006 and 2011) [UPDATE: Camp 18 may have been moved to Tongrim-ri in neighboring Kaechon. 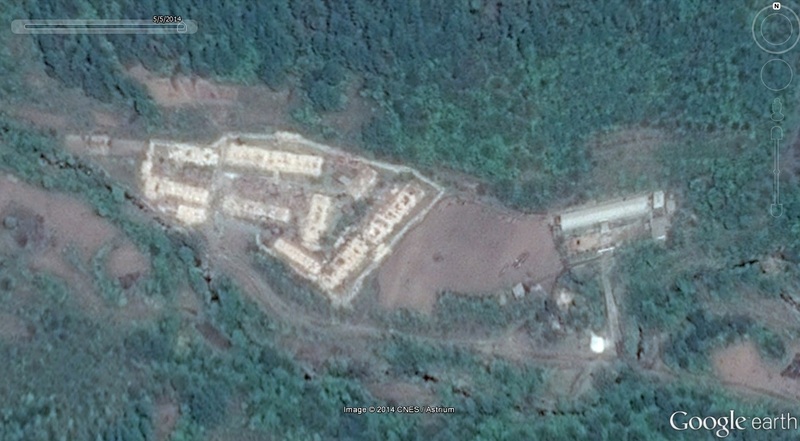 I first wrote about the new prison camp here, though I did not know it was the remnants of Camp 18]. 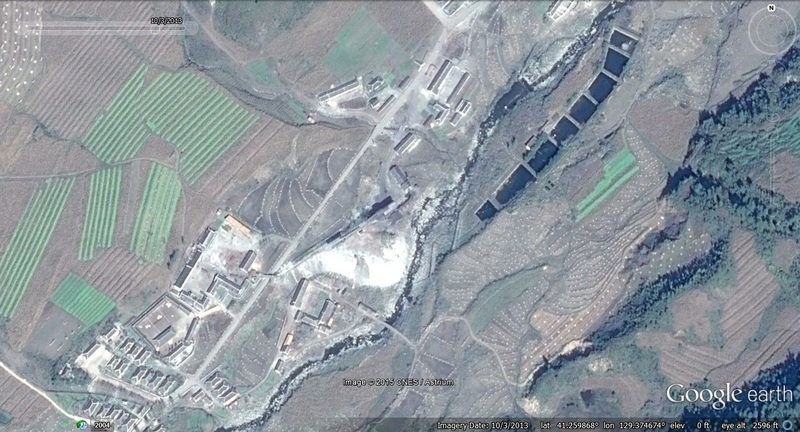 The coal mine located inside the camp, the Pongchang District Coal Mine (봉창지구탄광), was even featured on North Korean television on 2011-1-3, 2012-2-27, and 2012-10-20. 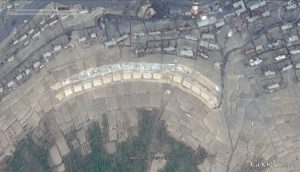 Recent satellite imagery of the camp featured on Google Earth (2016-3-30), however, indicates that a new prison camp has been opened on the site of the former prison sometime between 2013 and 2015. If a new prison camp has been been opened, it’s name and administrative classification remain a mystery, though I post some evidence and speculation below for your consideration…. 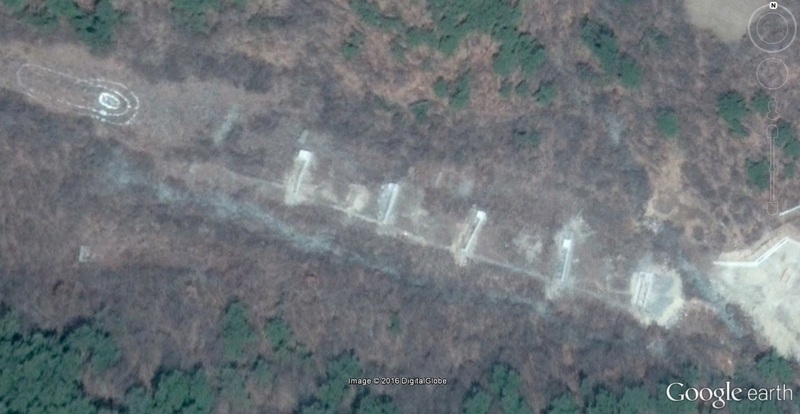 A new security perimeter has been built around the former Camp 18, and it is not built along the same path as the old Camp 18 security perimeter. 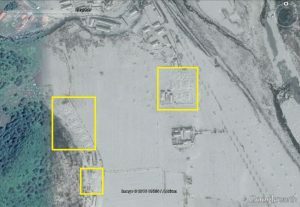 The difference between the security perimeter of the old Camp 18 and the new prison camp can be most clearly seen along the eastern and norther edges of the camp. 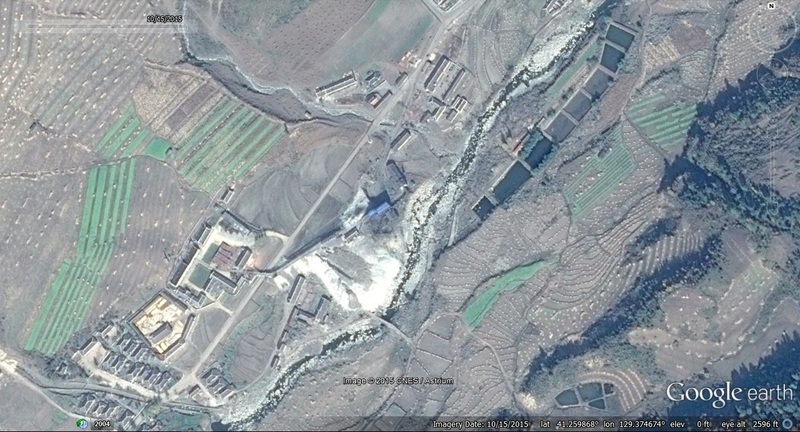 Camp 18 had a security perimeter along the norther border, and remnants of it still remain, but the new prison camp does not yet appear to have a northern border (other than the Taedong River). The new security perimeter appears to be composed of two barbed-wire fences held up by concrete posts. The new security perimeter has five new guard posts along the mountain ridge and two new security checkpoints, one at each of the two transit points. The eastern security checkpoint appears to be the main entrance. 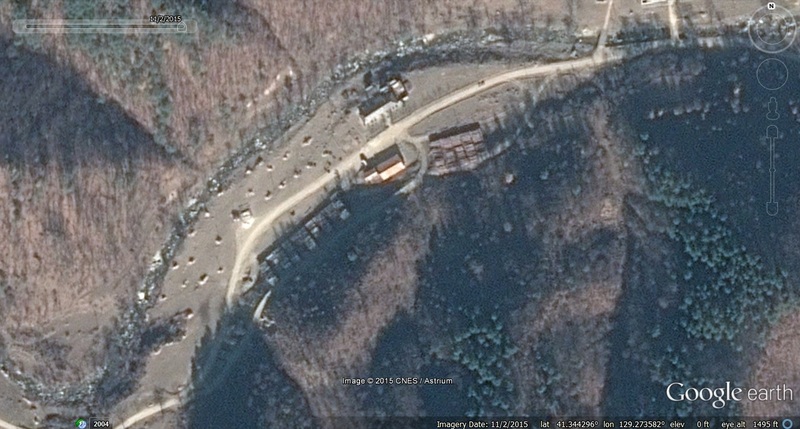 The southern mountainous checkpoint appears to be for delivery of coal to the “famous” 2.8 Jikdong Youth Coal Mine Mine (2.8직동 청년 탄광) located outside the security perimeter. 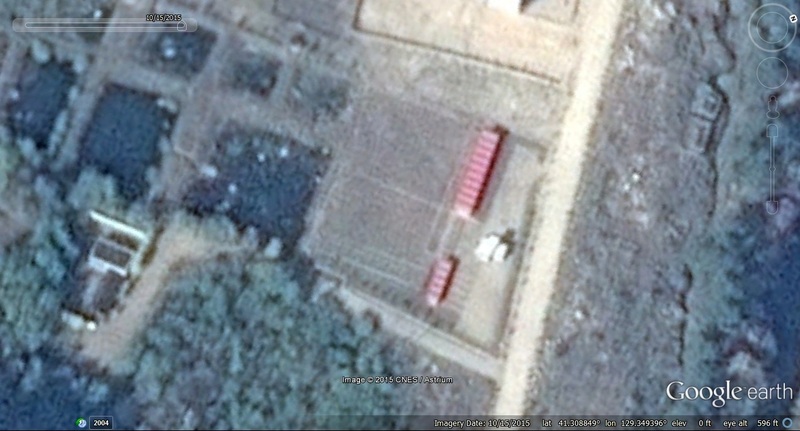 Here is a closeup of the new guard post at 39.546986°, 126.018297°. 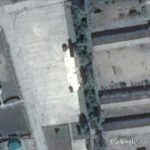 It was built between 2013-10-1 and 2015-4-4. You can also see the barbed wire perimeter running next to it. There is also a guard post on the bridge that links the area with Camp 14, but this checkpoint appears to be a remnant of the former Camp 18. 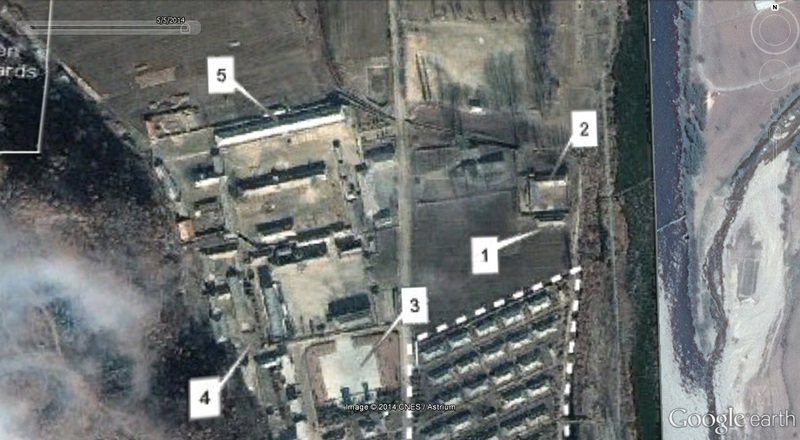 There also appears to be six facilities (four that are new) that could serve as guard barracks scattered around the camp. 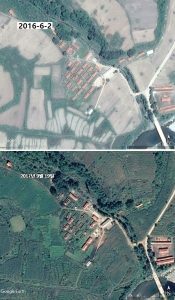 A substantial amount of housing was razed in the camp between 2013 and 2016, which would support the idea that “innocent” people were moved out of the camp perimeter (possibly to eastern neighboring Myonghak Coal Mine (명학탄광) or Tukjang Youth Coal Mine (득장청년탄관) which have both seen substantial housing growth starting in 2011). It is possible that once the “innocents” were moved to the neighboring coal mines, the Pongchang Coal Mine in the former Camp 18 could return to the exclusive use of prison labor. 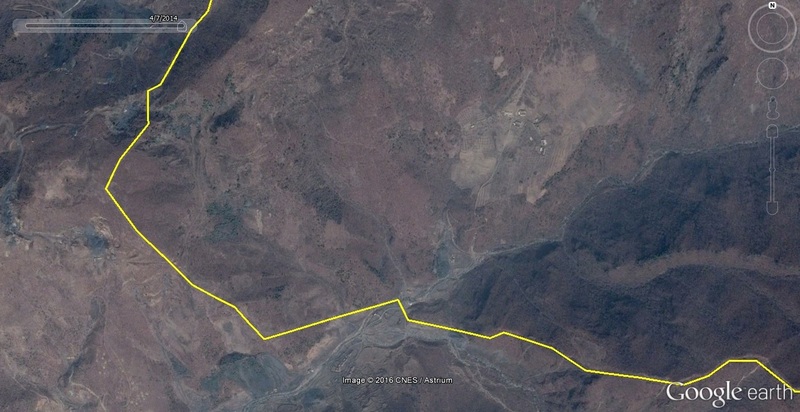 In image above areas where houses were destroyed are outlined in red. 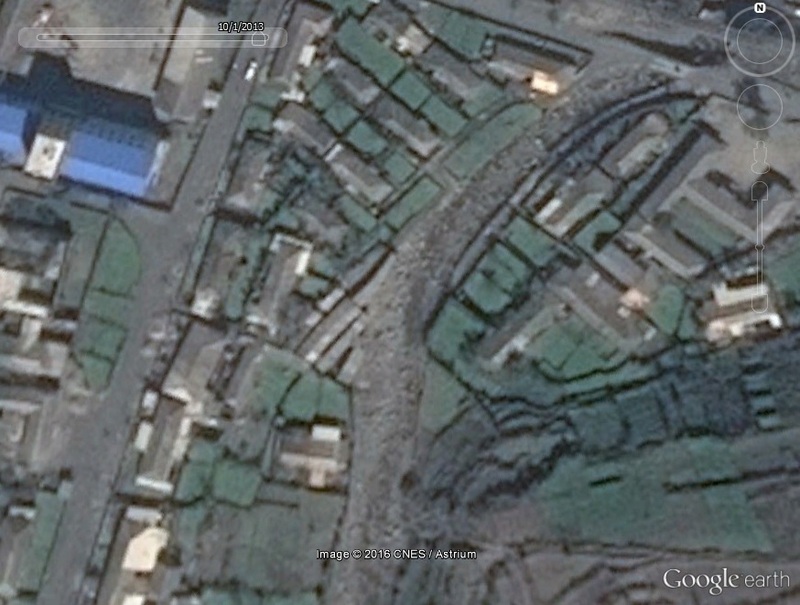 Below are images from neighboring Myonghak Coal Mine (명학탄광) which saw a housing boom starting in 2011. 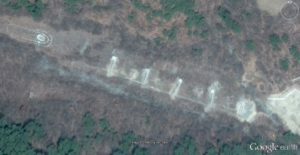 Were these people being removed from former Camp 18? 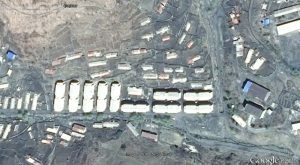 By 2014, this new housing construction appeared to be complete. 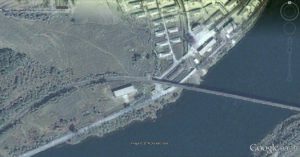 The Pongchang Coal Mine received a market when Camp 18 was closed, but it has been torn down with the arrival of the new camp. 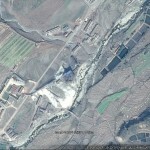 You can see remnants of the market here: 39.564626°, 126.075621°. 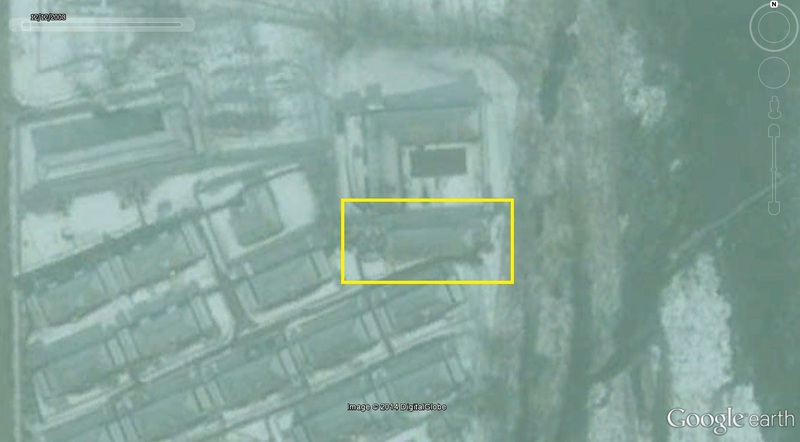 The “immortality tower” that is present in the vast majority of villages, factory complexes, and mining complexes has been removed. The monument was torn down sometime after 2013-10-1. I am not sure what this means. 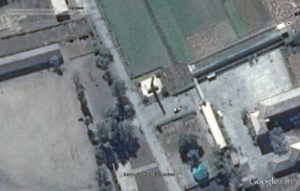 Although all prison camps have an immortality tower next to the MSS administrative buildings, they are not found in remote parts of the prison camps. When Camp 22 was closed, we could see immortality towers being built in parts of the camp that were being converted to normal villages (because they did not have them, and most other normal villages did). Perhaps a new tower will be built next to the headquarters building in due time so that the new camp will in this respect be identical to all the others. 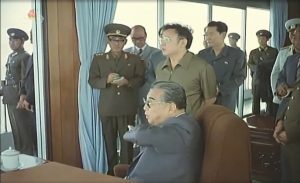 Another possible explanation for the tower’s removal is that it is being “updated” to include fidelity to Kim Jong-il and Kim Il-sung, as many other towers have been. 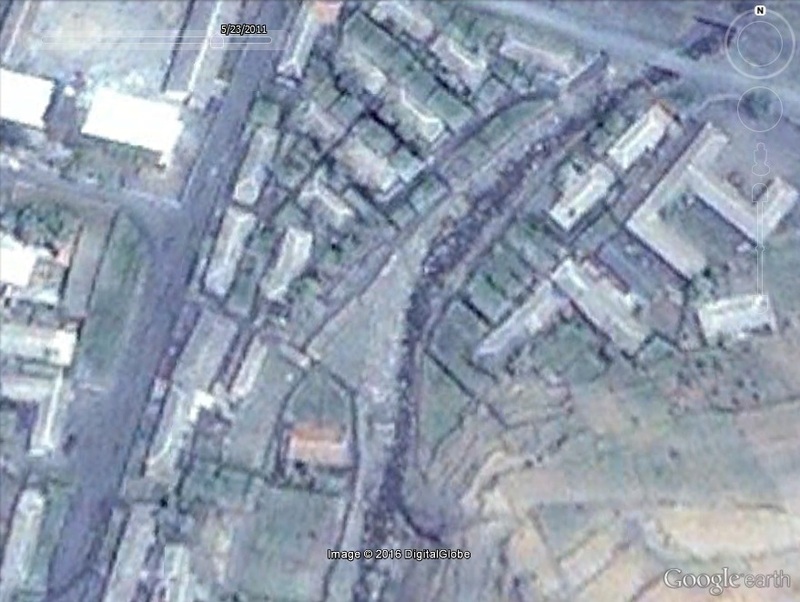 The main administrative area featured a single Kim Il-sung monument as of 2011-8-19. 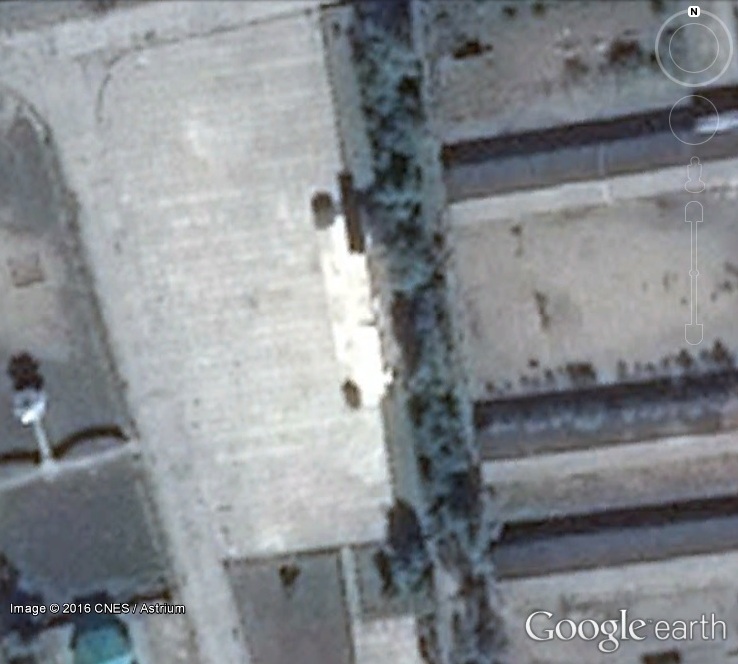 By 2013-10-1 the camp appeared to have the new Kim Il-sung/Kim Jong-il double monuments which have become popular in the Kim Jong-un era. 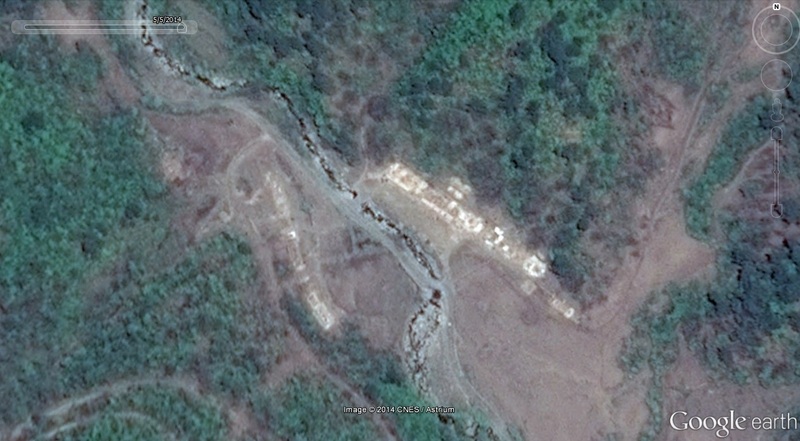 However, by 2016-3-30, both monuments have been removed. Did Camp 18 merge with Camp 14? 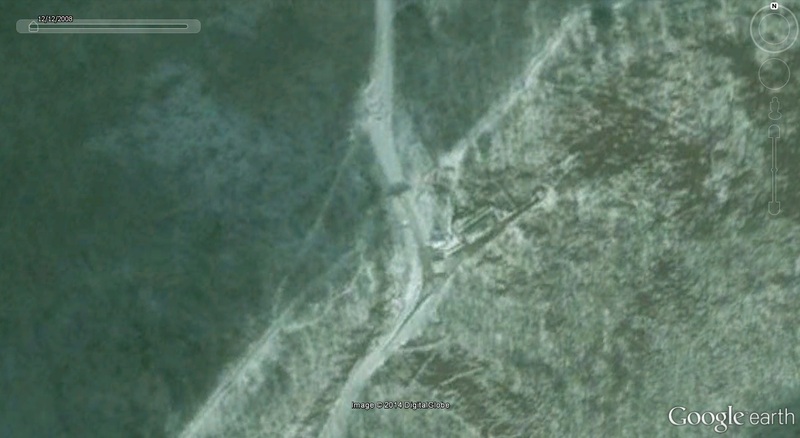 Pictured below is the ferry that goes between Camp 14 and former Camp 18. It was built sometime between 2007 and 2011 (sorry, not much imagery here). Coordinates: 39.589340°, 126.077555°. The fact that a ferry appears to be operational between the two prison camps, coupled with the observation that the new camp has no northern perimeter (and that they have always been connected by railway and temporary road), supports the hypothesis that the Camp 18 area may have been taken over by Camp 14. The history of the relationship between Camp 14 and Camp 18 is complicated, but there is also some historical precedent. 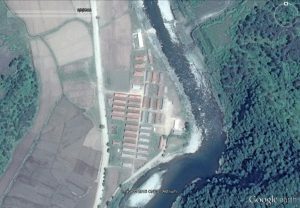 If this is a new prison camp, and I believe the evidence shows this is plausible, it will be the second in the Kim Jong-un era. 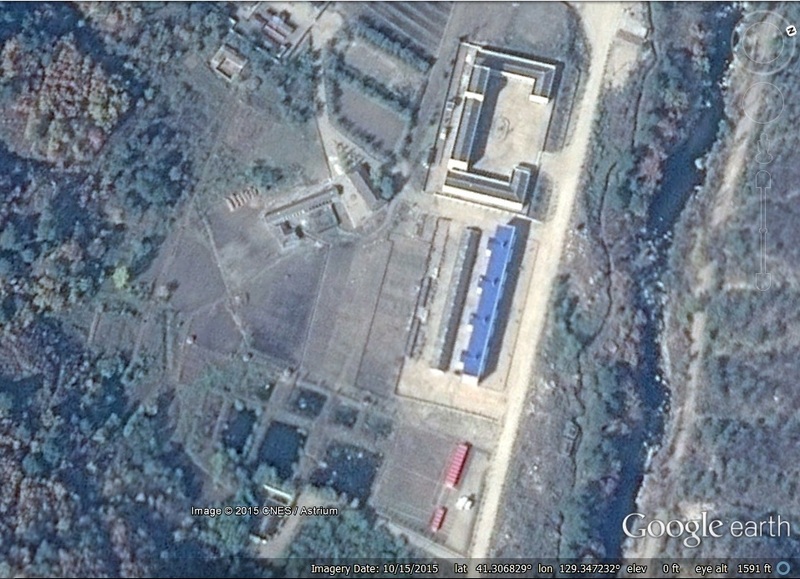 I spotted the first new prison facility of the Kim Jong-un era (which later turned out to be the relocated Camp 18) in January 2013 on the north west side of Camp 14. Pyongyang, December 10  (KCNA) — In the Democratic People’s Republic of Korea there are many people devoting their clear conscience and even lives to the prosperity of the country. Ri Yong, a heading workteam leader of the Pongchang Area Coal Mine, devoted his life to the coal production. Working at the mine for nearly three decades as a heading worker and a heading workteam leader, he, together with his men, had procured thousands of tools and accessories needed to overfulfil the workteam’s heading plan every year. He had dedicated his all to coal output, encouraging his men to do their part as coal miners to increase the production. That is why he, though dead, is still remembered by people. Among such patriotic coal miners as Ri Yong are Jo Nam Sik and Kang Kye Jin of the Kangso Coal Mine. Jo rescued fellow colliers when a pit was collapsing in last June, while Kang was an official of the mine with a 30-odd years long career of pitman. Ri Jin Guk, a worker of the Sunchon Plastic Daily Necessities Factory, kept his machine going until the last moment of his life, giving a pattern of life devoted to the country. 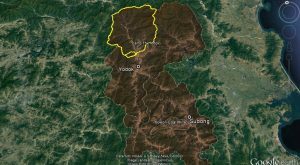 Sonu Pong Nam, a hewer of the Ryongnam Coal Mine, Sin Kum Nam, a farmer of the Ryongok Co-op Farm in Yomju County, Kim Ho Sok, a worker of the Kosan Essential Foodstuff Factory and Ri Jang Gun, a member of the Revolutionary Battle Site Management Office at the secret camp of Mt. Paektu are also known as patriots who lived for the prosperity of the socialist motherland. 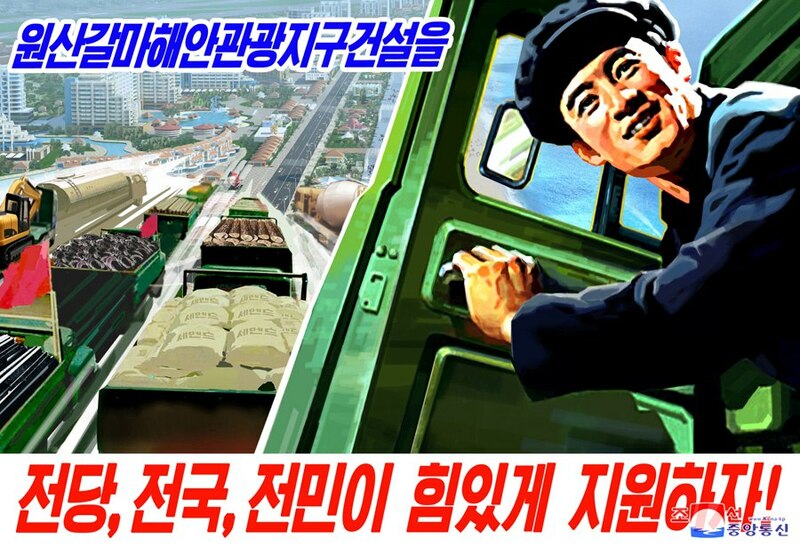 Their true life and working manner recorded in the history of the building of a great, prosperous and powerful nation inspire the Korean people to work miracles in the efforts to bring about a new revolutionary upsurge. 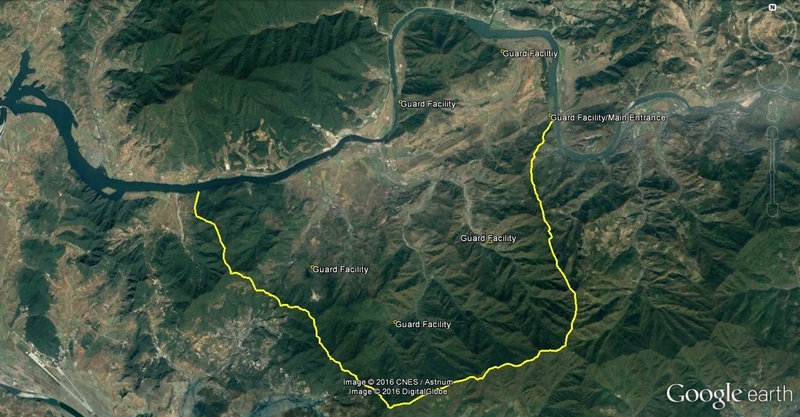 Pyongyang, August 27  (KCNA) — Some days ago, the 3rd-shift group under the 6th pit of the Pongchang Area Coal Mine in the DPRK was doing preparatory works for next shift after fulfilling its daily quota at 102 percent. 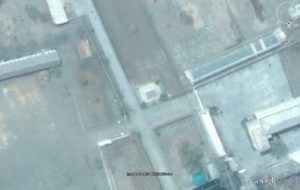 At that time, hundreds of meters of pit ceiling fell down, affected by earth pressure, leaving the pit entrance closed. The miners could come out of the pit through an air tunnel. But they did not stop mining coal. 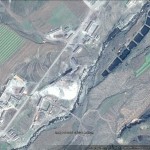 They turned out scores of tonnes of coal for 19 hours until the entrance reopened. Their devoted efforts were prompted by a strong sense of patriotism to contribute to the country’s prosperity even a bit. Pictured Above (Google Earth): Kwanliso 14 (Camp 14) outlined in the center and in the upper left a smaller prison camp area I was the first to discover in January 2013. 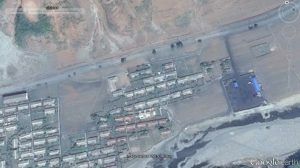 Google Earth has uploaded new imagery of Camp 14 and an auxiliary prison camp on its northwest border (first noticed in January 2013) whose formal name remains a mystery. The new imagery is dated 2016-3-30 and it shows a number of facility upgrades in the prison camp. 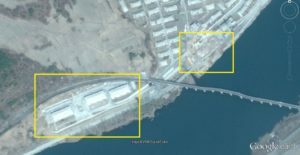 These upgrades suggest the camp continues to serve a necessary role for the North Korean government and will probably not be closed for the foreseeable future. Below I list some of the changes Camp 14. Some of them I have already reported in Radio Free Asia. 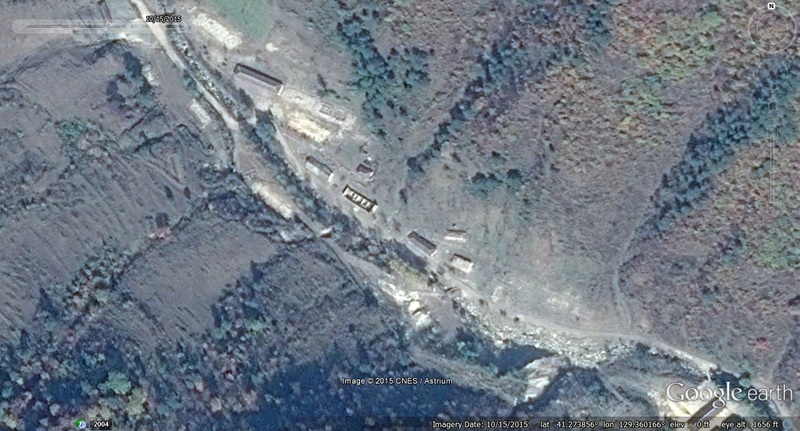 Pictured above is a new firing range constructed between 2013-10-1 and 2016-3-30. 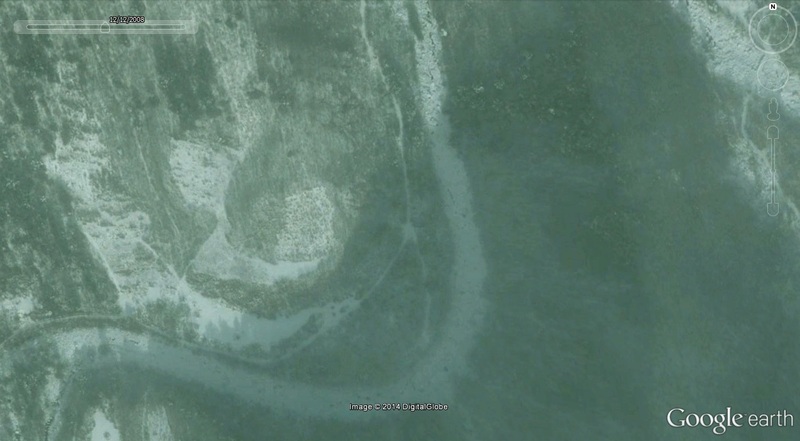 It is approximately 240m from the firing position to the bulls-eye in the painted hill-side target in the upper left. 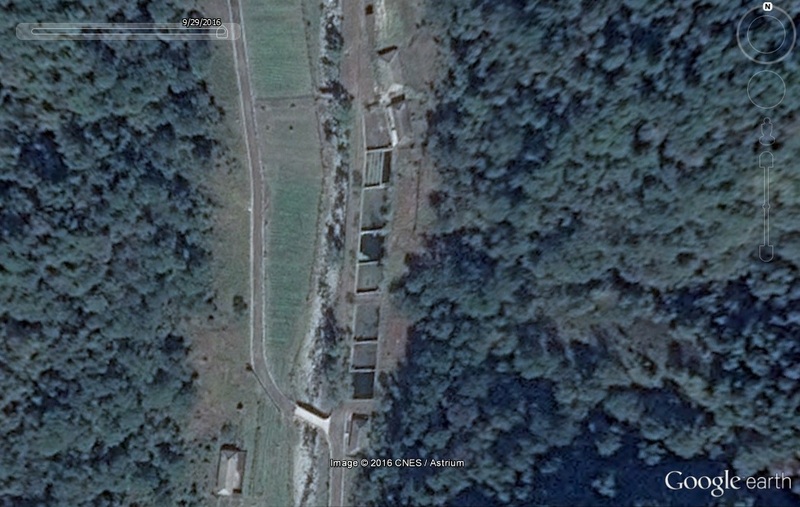 This firing range has been built near the camp headquarters (coordinates: 39.574979°, 126.047860°). Two other smaller firing ranges have been built/renovated along the western perimeter. 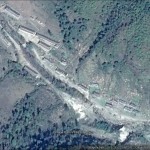 One is near the camp entrance at 39.559300°, 126.013005°. 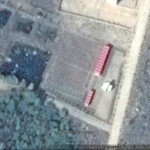 The third firing range is not new, but is being renovated at 39.629702°, 126.035436°. 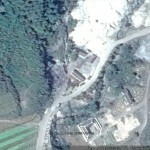 Pictured above is a small fish farm in Camp 14 (Coordinates: 39.606592°, 126.098545°). 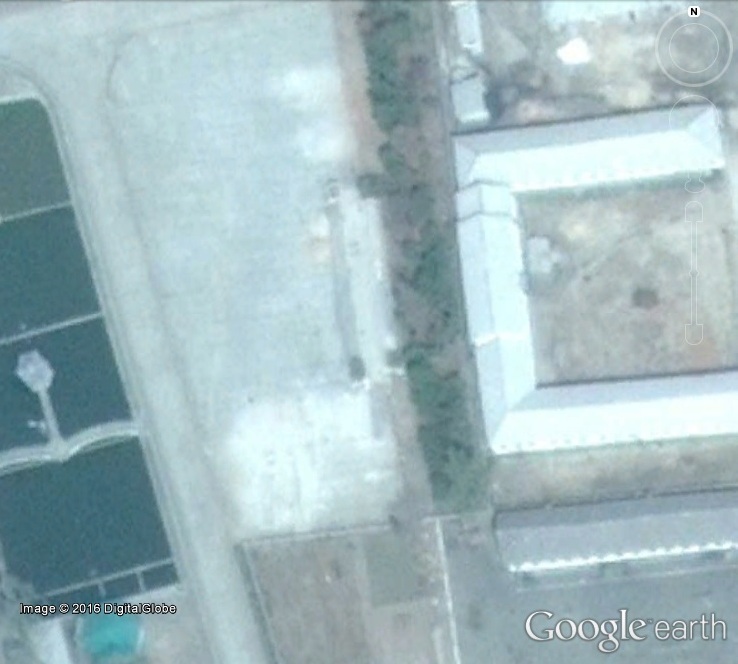 In the top photo, dated 2013-10-1, we can see the fish farm before renovation. In the lower photo, dated 2016-3-30, we can see it after renovation. 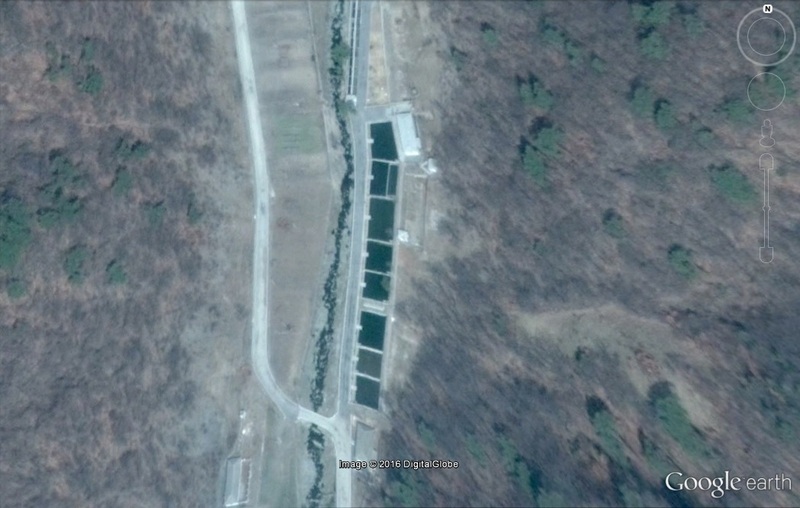 Fish farms at 39.600450°, 126.072176° and 39.601567°, 126.051970° have been similarly renovated. 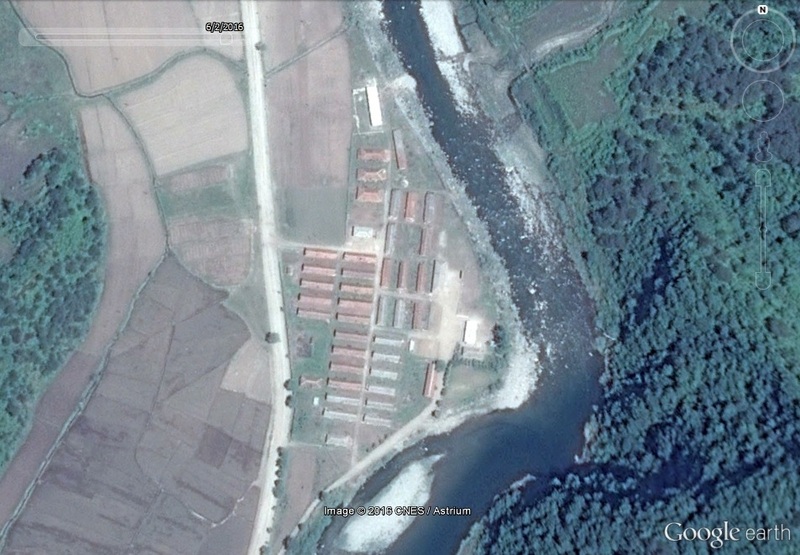 I suspect that fish produced at these farms could be intended as a food source inside the camp for guards and administrators (maybe prisoners? ), but they are more likely used as a source of funding to support the camp operations. In this case they would be sold domestically to the official wholesale distribution system and/or to other quasi-private vendors, or sold internationally through a trade company controlled by the Ministry of State Security. The headquarters area of the Camp (administered by the Ministry of State Security) has been renovated. 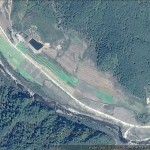 In the area next to Camp 14, near Tongrim-ri in Kaechon City, we can see a few interesting developments. 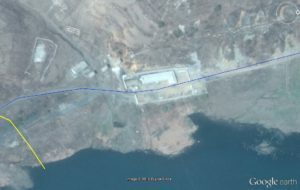 In the south east corner of the camp area, a road has been built from the Mujindae Youth Coal Mine (무진대청년탄광) inside the camp security perimeter (yellow line) to promote coal mining. The road allows coal mined inside the camp perimeter to be loaded onto the railway network for domestic or international shipment. 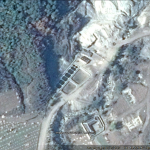 In the satellite imagery we can see the emergence of some new graves over time. This is unusual. 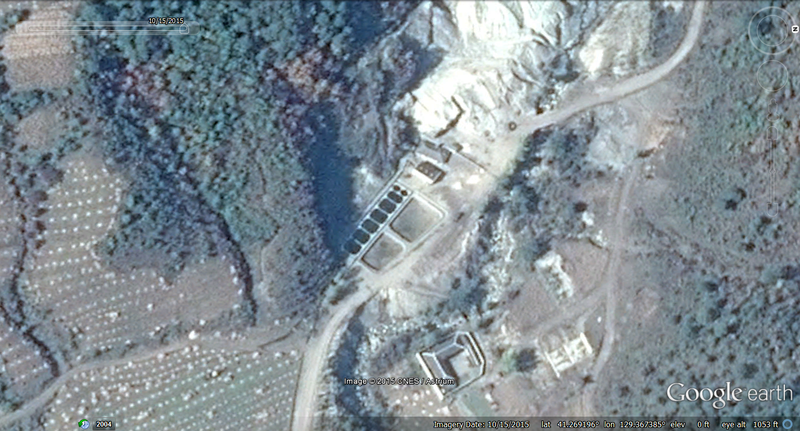 In most North Korean prison camps, identifying graves is not this easy, and rarely are there any traditional Korean graves like these on the hillsides (there are none in Camp 14 as far as I am aware). 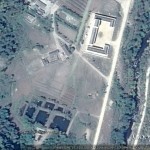 What this means about the prison area is an interesting topic of discussion. 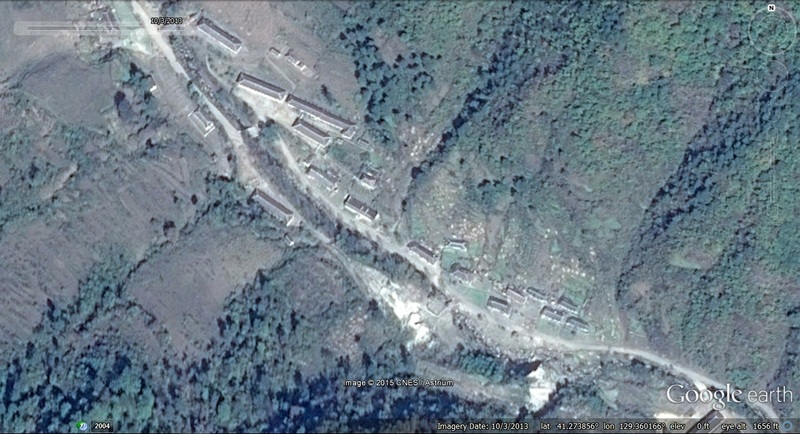 Finally, recent satellite imagery of Camp 18, which is believed to have been closed by 2011, indicates that the prison camp may have been relaunched! You can read about it in Radio Free Asia now, and I will post more on that tomorrow (Friday). 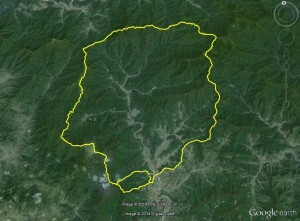 Pyongyang has 230 mile (371km ) perimeter and area of 679 sq miles (1758 sq km). 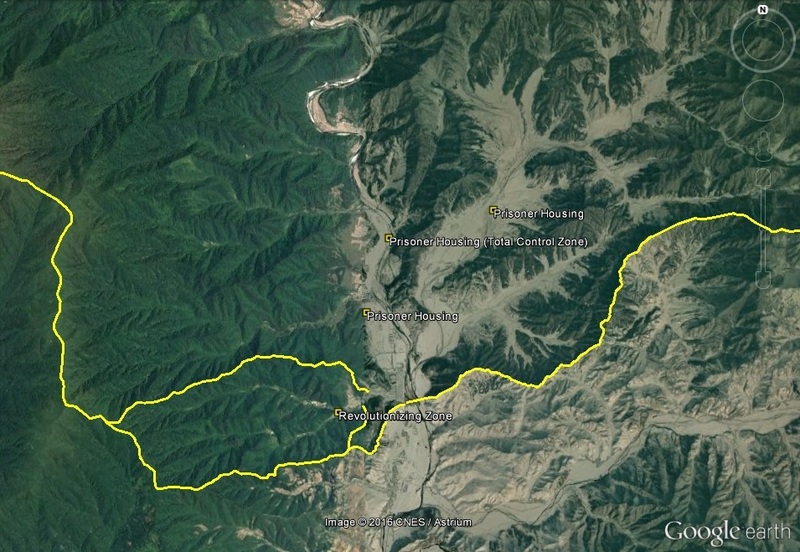 Camp 16 has 72 mile (115 km) perimeter and area of 212 sq miles (548 sq km). 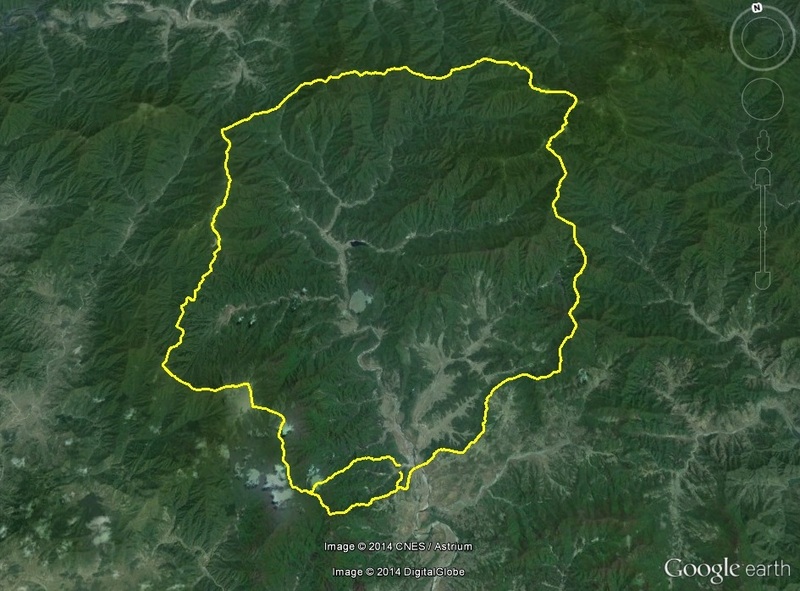 So Camp 16 is approximately 31% the current size of Pyongyang. If we included Sungho, Sangwon, and Junghwa, which were moved into North Hwanghae Province, the percentage would drop even further. 2. 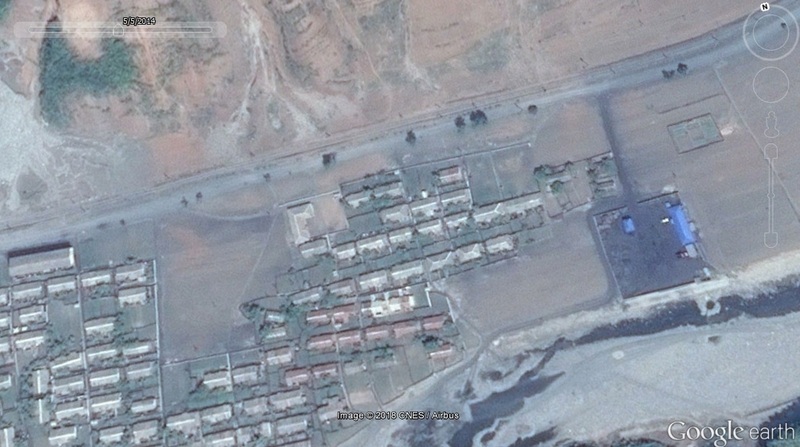 New housing and possibly a sports field. 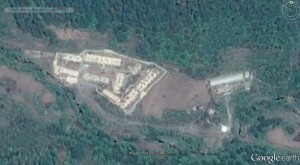 A new apartment block was built in the camp. It appears to be nearly 160m in length and is composed of just a couple of stories. The building behind it that is probably for livestock. The picture also reveals what appears to be a sports field of some kind next to the housing. 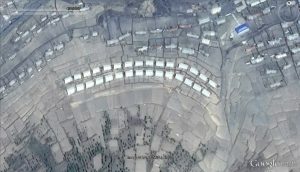 The image is not very clear, so this could be something else, but I am not sure what. Here is a closeup of the “sports field”. If you have a better idea what this is, please let me know. 3. New fish farm. 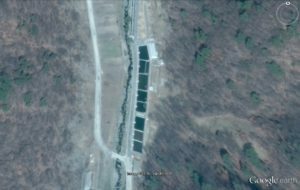 The fish farm is small, just over 1,100 sq meters surface area. 5. 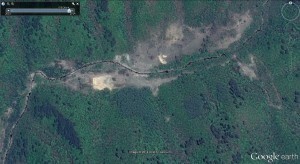 Evidence of continued mining and logging. Below we can see evidence of mining activity since 2013. If the minerals that are mined and the lumber that is harvested are exported for hard currency, the transaction would likely involve a trade company under the control of the Ministry of State Security (MSS, SSD, NSA), however, I am not privy to the details of those transactions. With a few exceptions, formalized markets have grown in North Korea over the past few years. In some cities, they have more than doubled, while other cities have seen only nominal or no changes. 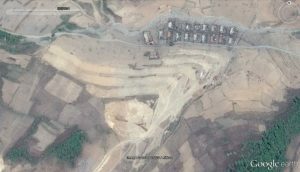 Only Pyongsong, the capital of South Pyong’an Province, has seen a significant decline in aggregate market space. There exists only a weak correlation between population size and aggregate market space. 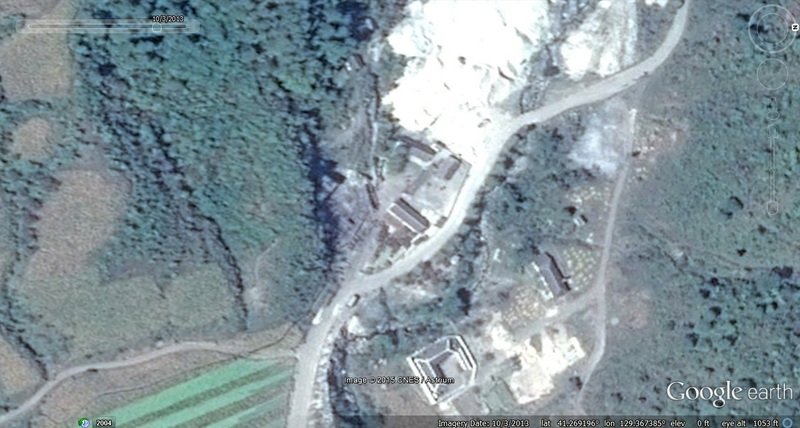 The correlation between aggregate market space per capita and proximity to Pyongyang, a large driver for demand in the North Korean economy, is also relatively weak. The largest aggregate market space per capita can be found in cities in the southwestern part of the country. This suggests that trade on formal markets may be driven by other factors than those commonly assumed, such as sea route trade and agriculture. 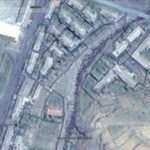 Satellite imagery of the east coast of Korea dated 2014-7-4 has recently been uploaded to Google Earth. 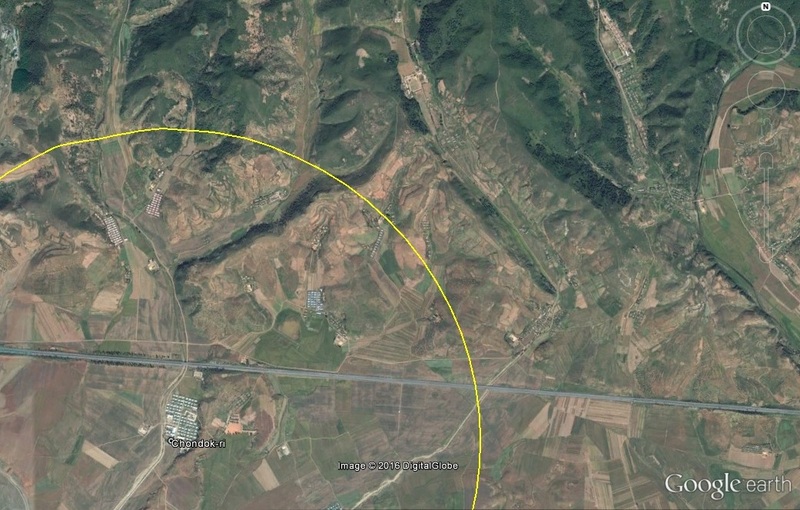 Among the more noticeable items is that Kim Jong-un had a new runway built at his family compound in Wonsan right next to his private train station. 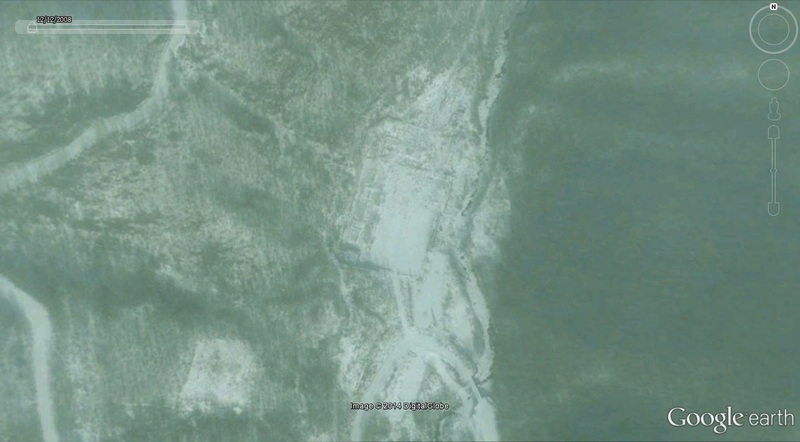 In the top picture you can see a small helipad (where Dennis Rodman landed) which was torn down to make way for a runway, approximately 560m in length. 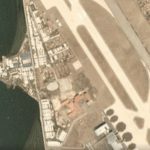 The new runway should be able to accommodate small aircraft and helicopters. Although Kim Jong-il favored trains, the North Korean media has shown Kim Jong-un traveling by car, boat (military and yacht), and plane (even sort of flying one). Last summer Kim’s guidance tour schedule seemed to suggest he was spending much of the time in Wonsan. With a runway like this, he will presumably be able to get around the country more easily from his “summer home”. 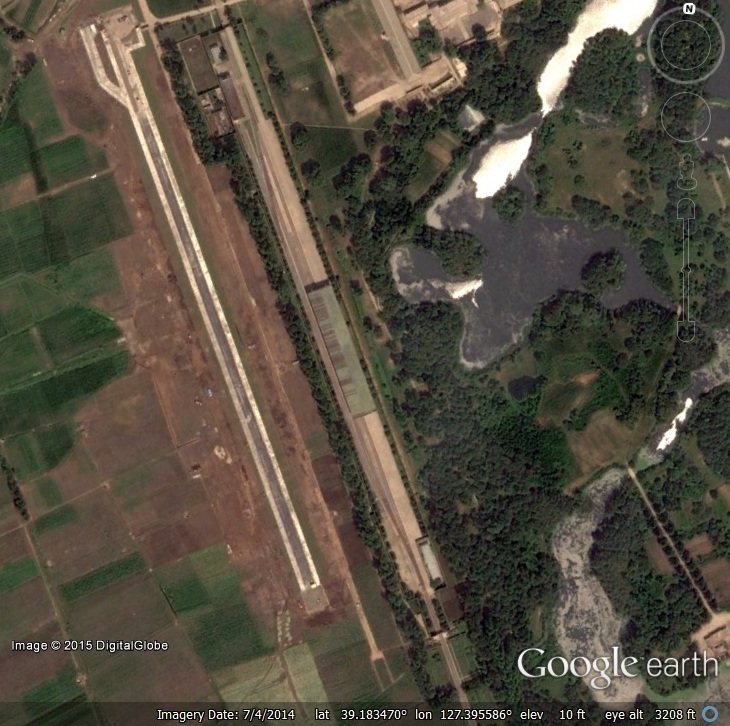 Maybe in future satellite imagery we will get a view of his personal craft on the runway! This was picked up by Radio Free Asia. You are currently browsing the archives for the Google Earth category.